The September trip to Liverpool and back. 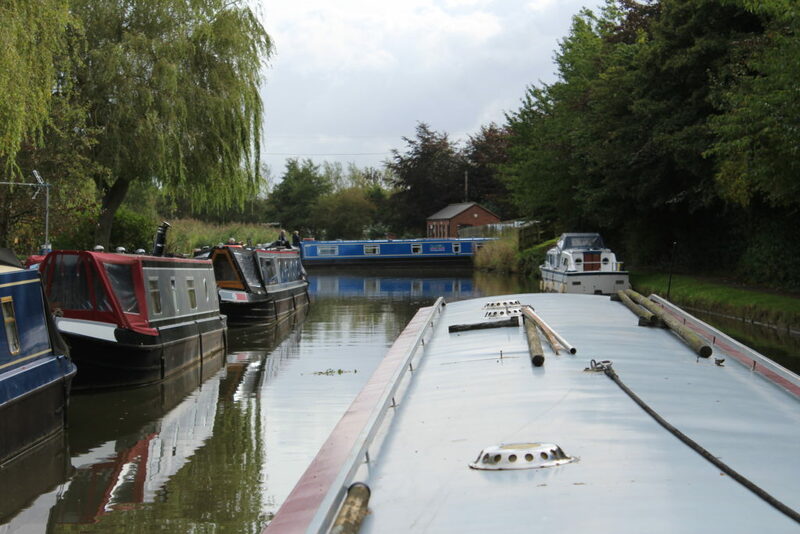 From Wrenbury Church Visitor Moorings to Tom's Moorings, a distance of 19 miles, 7¼ flg and 31 locks. 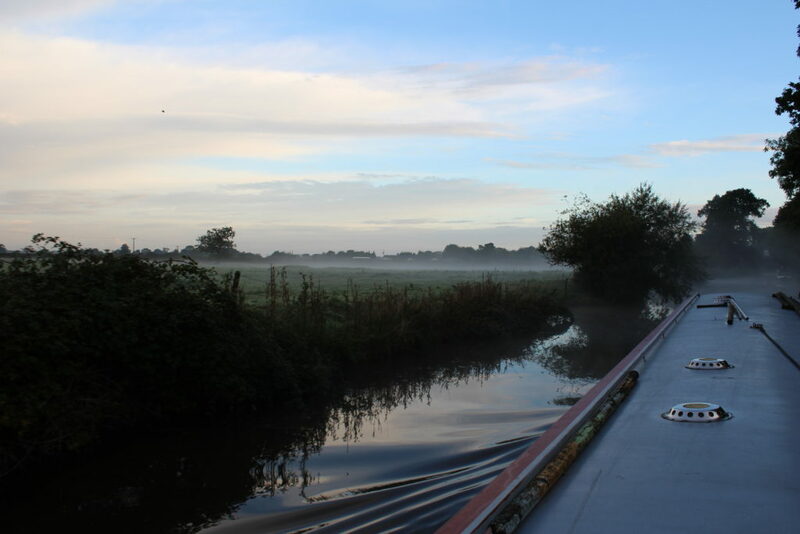 It was a little misty when we cast off, but that’s part of the attraction of boating at this time of year. 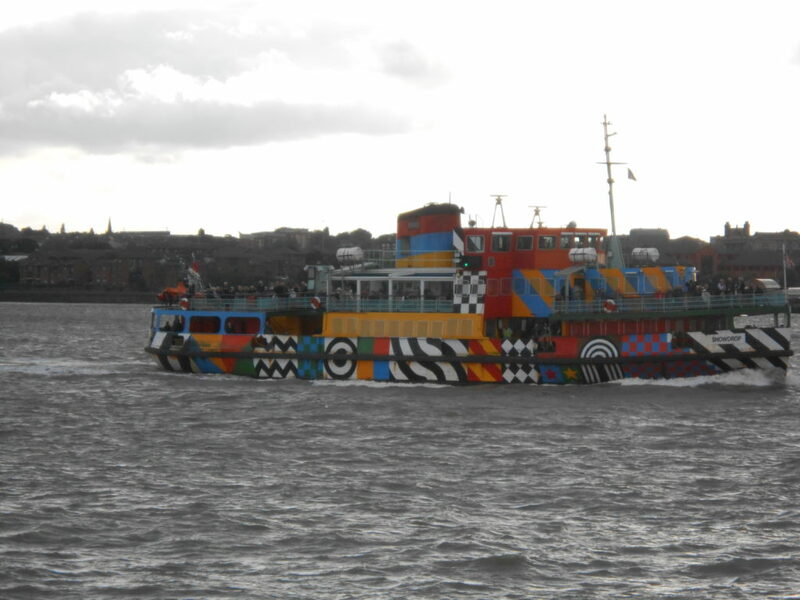 Once again we were the only boat on the move and with the current behind us we made good progress. 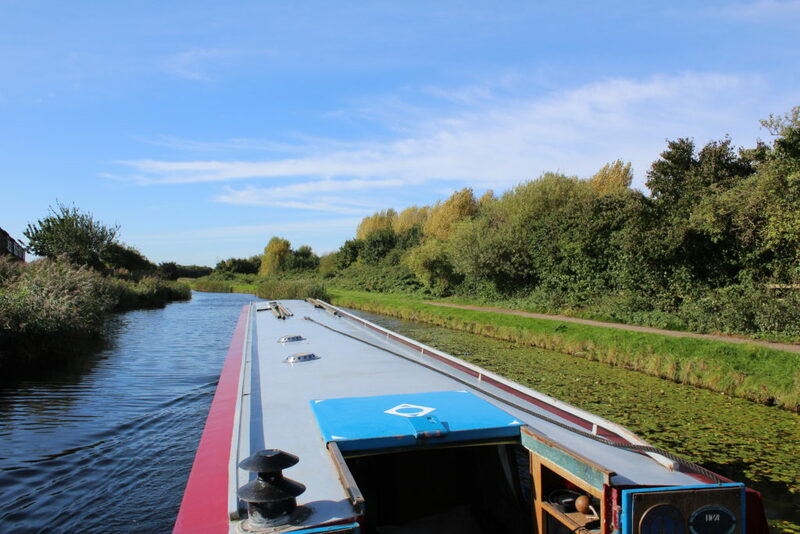 We only met one boat on the move on the whole trip back down to Hurleston locks where we actually saw several boats on the move – some going down the locks and some coming up. By now the mist had cleared and the weak sun was now blocked by low clouds. We got out of the locks and turned under Hurleston Roving Bridge No 97 and that’s when the rain started – the sort of rain that isn’t that heavy but somehow manages to leave you totally and utterly soaked through in no time at all. 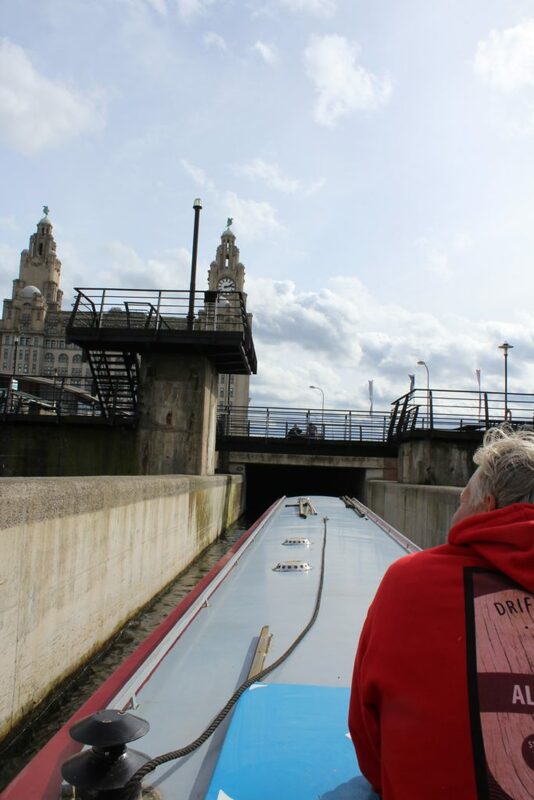 So we made our way south to Hack Green Locks where we met several boats with equally soaked crew. 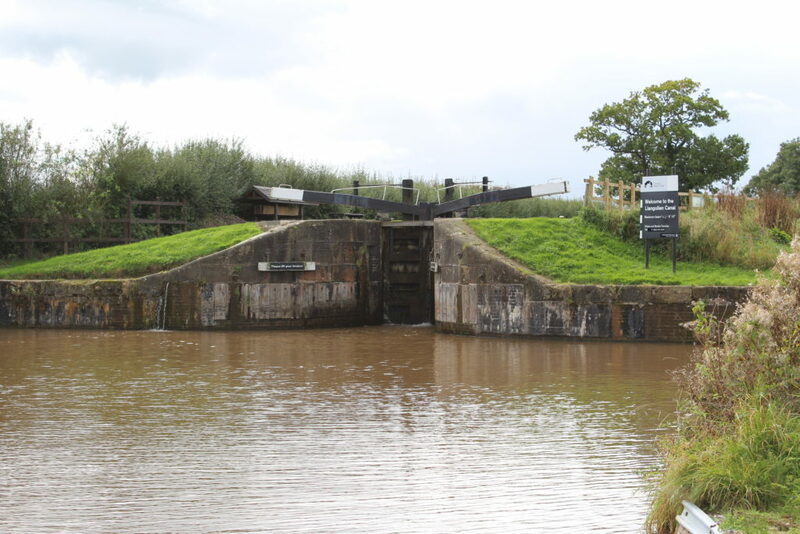 The rain had made the grass and the lock sides quite slippery so working locks was not as quick as it usually is. Although the sky did lighten a few times the rain never really stopped and by the time we got to Audlem Bottom Lock No 27 the thought of pushing up through all locks really wasn’t appealing. 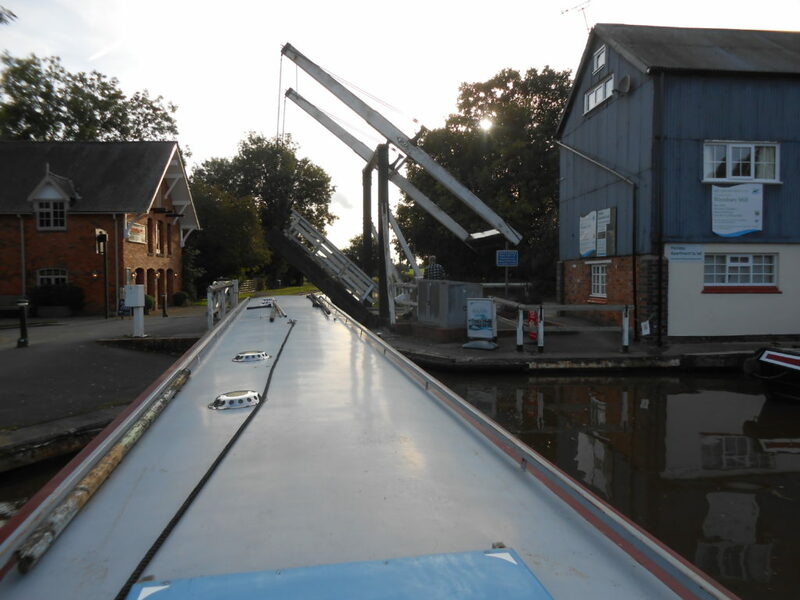 A couple of boats had cast off from Audlem Wharf but good progress was made up the flight. 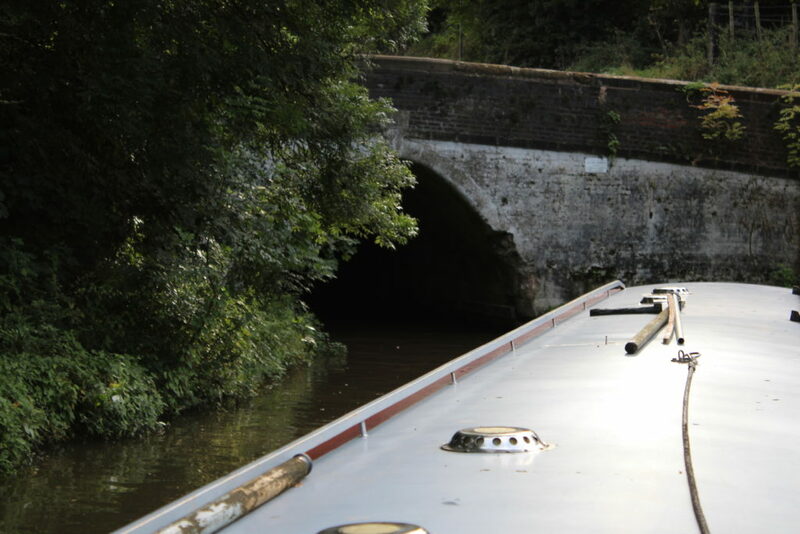 We’d decided that we’d push on back to Market Drayton for the night and guess what… yes that’s right… it stopped raining just as we moored up on our home mooring. From Middlewich Visitor Moorings (Middlewich Branch) to Wrenbury Church Visitor Moorings, a distance of 19 miles, 5 flg and 12 locks. No-one was on the move when we got up, but that seems quite usual for Middlewich and we pretty much had the canal to ourselves until we approached West Coast Mainline Railway Bridge No 22A where a work crew were getting ready to take their boat under the bridge to join the other work boats just beyond it where they seemed to be working on the offside bank. As we approached Stockhouse Bridge No 19 a boat coming the other way told us that there was some oil in the canal near bridge 16 and that they’d phoned C&RT but they didn’t seem to be concerned. 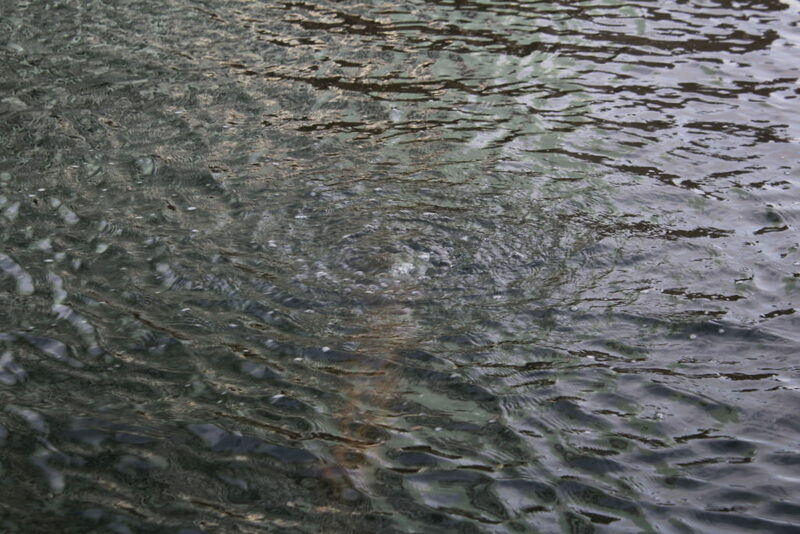 I sort of shrugged it off as we’ve all seen oil on the water from pumped bilges with a bit of a fuel leak. 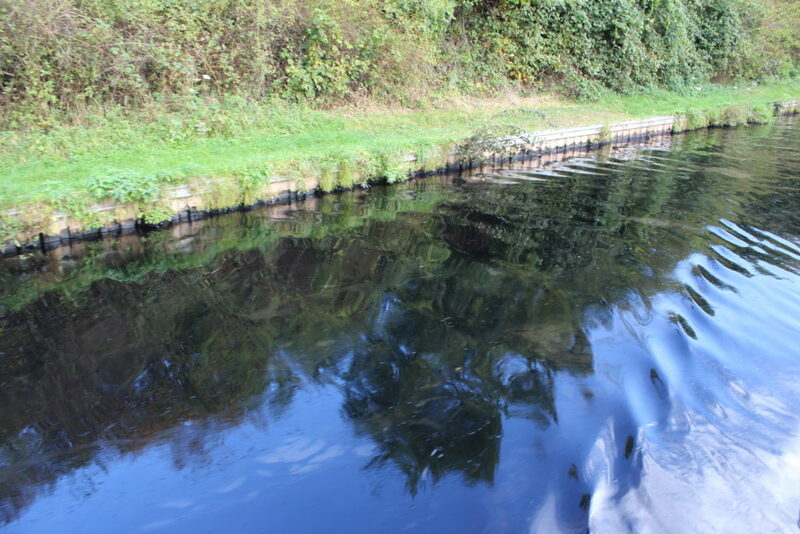 The oil covered the canal from side to side, the piling was covered in it as was the vegetation which dipped into the canal. 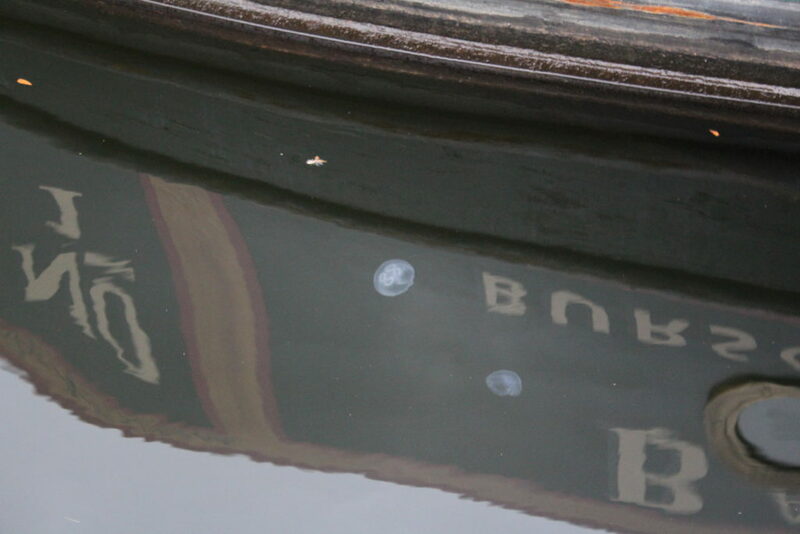 I posted a photo on C&RT’s Facebook Page and also phoned them – they said they knew of a problem but didn’t have any details I explained that it was thick black sump oil and that it was covering the canal for about a mile between bridges 16 and 13. So moral duty discharged for the day we stopped just before Aqueduct Marina for a late breakfast. 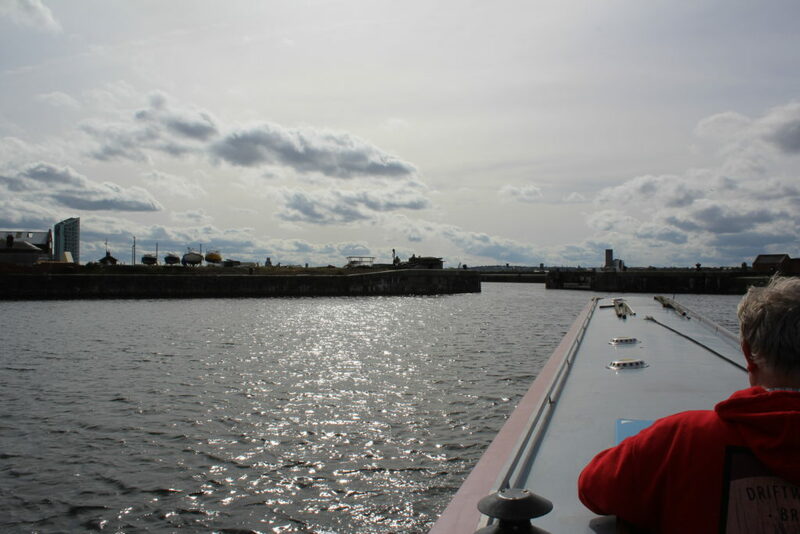 As we approached Minshull Lock No 2 the heavy looking clouds which had been approaching finally decided to dump their rain on us, and with the wind picking up it made working through the lock a far from pleasant experience. As usual for this lock we had to queue as a couple of boats worked their way through and so by the time we left the lock, and the rain had just about stopped, we were all rather wet and cold. We had to queue again at Cholmondeston Lock No 1 and with a boat doing an engine service right at the end of the lock moorings and boats moving round trying to get fuel it was slightly chaotic. At Barbridge Junction we didn’t meet a boat coming the other way but there were two boats at Barbridge Junction Stop Narrows trying to use the water point (which I understand has now been removed… which might actually be a good idea). From there right down to Bremilows Bridge No 100 there were boats absolutely everywhere and we were a little worried about just how busy the bottom end of the Llangollen Canal would be. 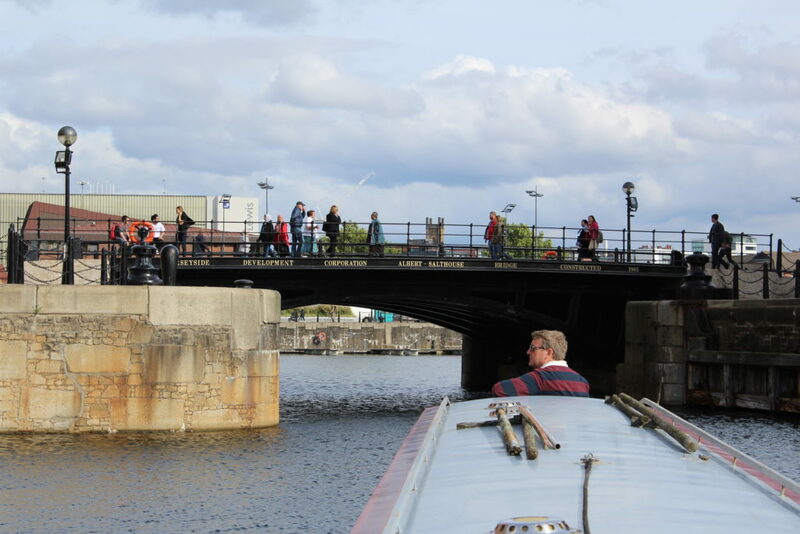 But there was no need to worry – we approached Hurleston Junction and there was one boat heading up the locks and there wasn’t a queue. 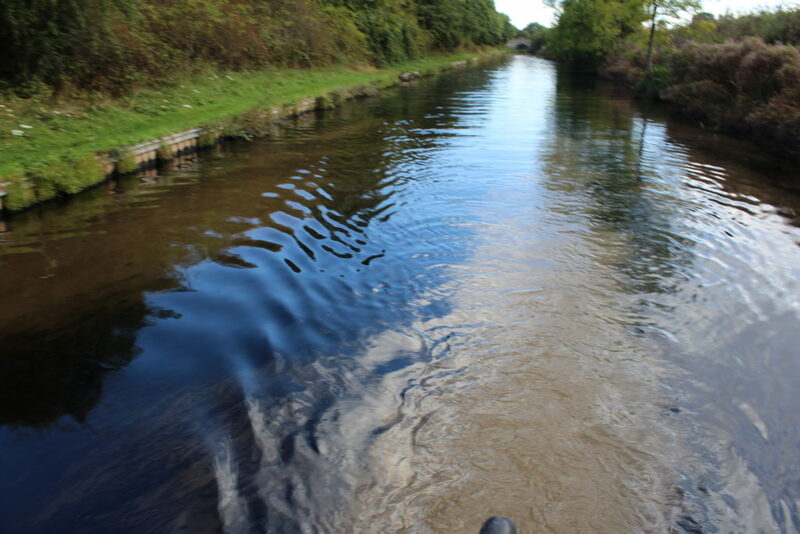 The Llangollen Canal has quite a flow on it as it is used to take water from the River Dee above Llangollen and deliver it to the large reservoir by Hurleston Locks. 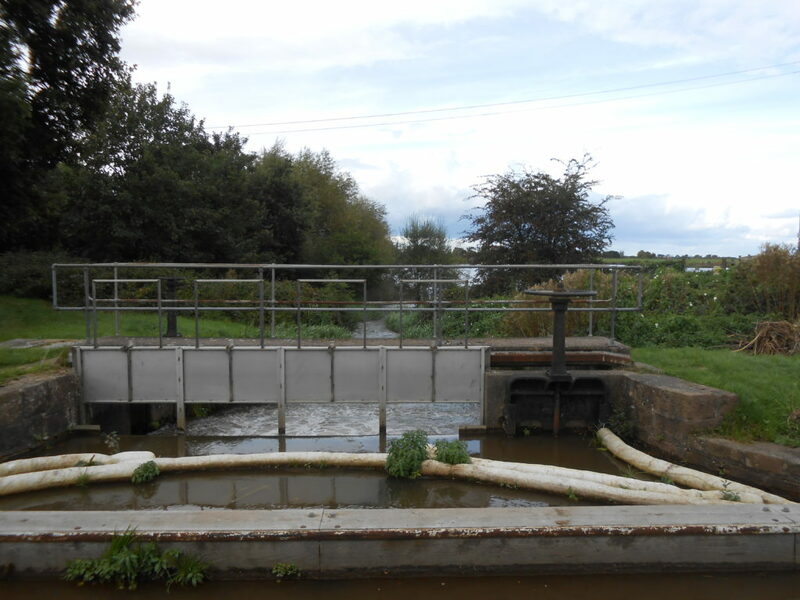 The water leaves the canal right above the top lock. 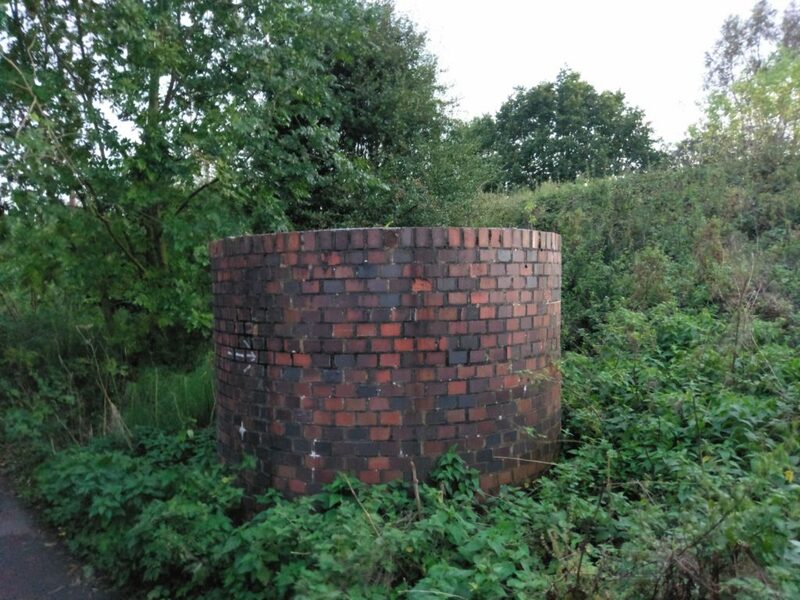 Canal feeder into the reservoir. 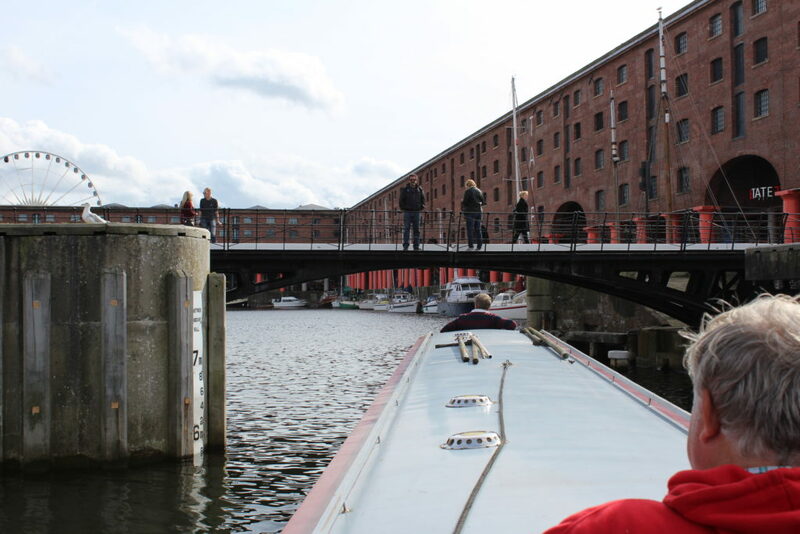 So unlike most canals progress up the canal is significantly slower than coming down and the deeper draft your boat is the slower the progress as the boat has to fight against the flow when going through bridge holes. 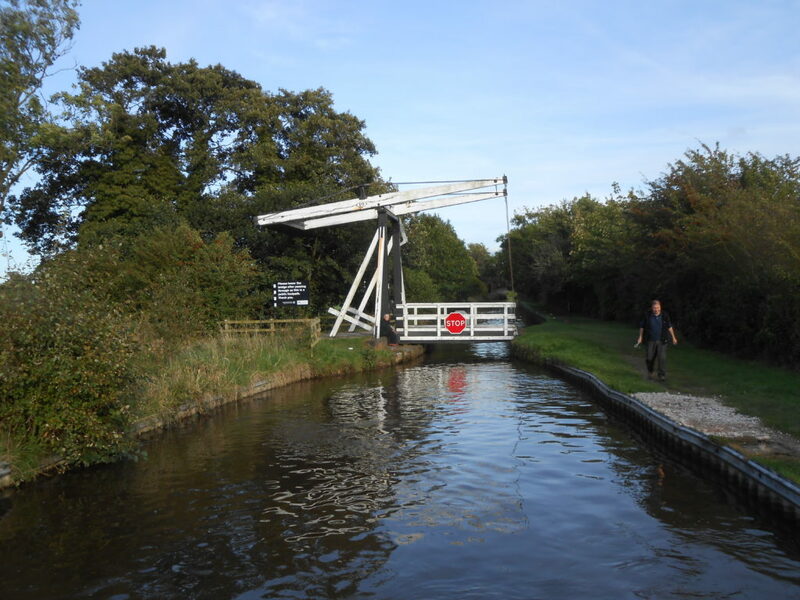 We headed to Thomason’s Bridge Winding Hole to turn before heading back down to the visitor moorings by Wrenbury Church Lift Bridge No 19 for the night. 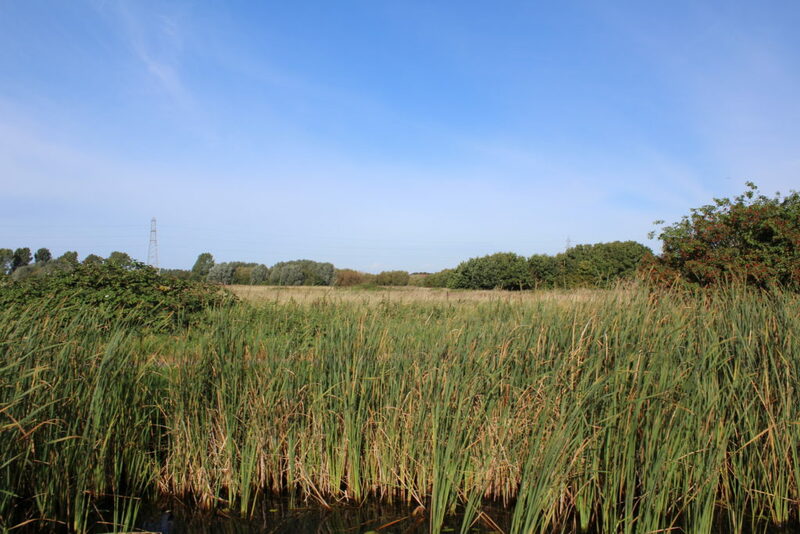 It’s a bit of a walk across the fields from here to the main road in Wrenbury and we decided that on the way back we’d probably use the road and the towpath. To get to the pub we had to head down to Aston which involved quite a lot of walking on dark country roads – we did cut the corner off at one point but decided that on the way back we’d stick to the road. 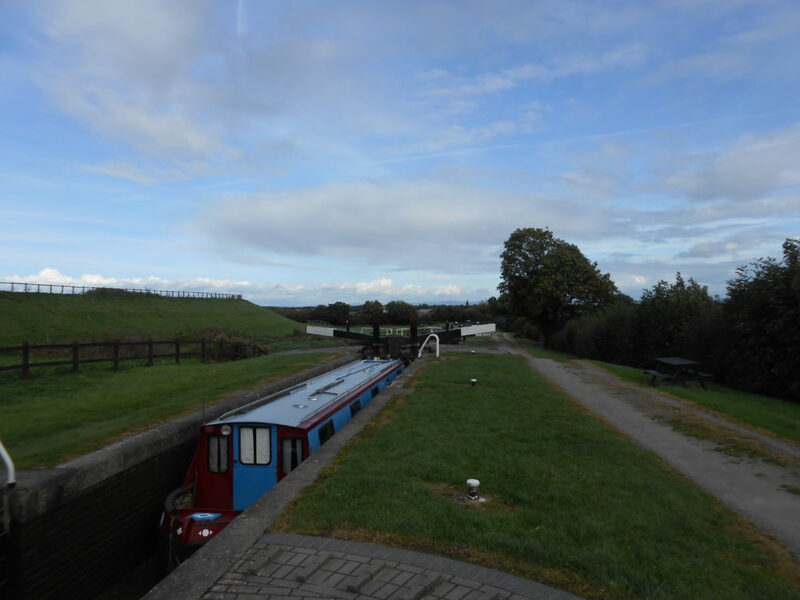 From Dutton Stop Lock No 76 to Middlewich Visitor Moorings (Middlewich Branch), a distance of 16 miles, 4¼ flg and 5 locks. 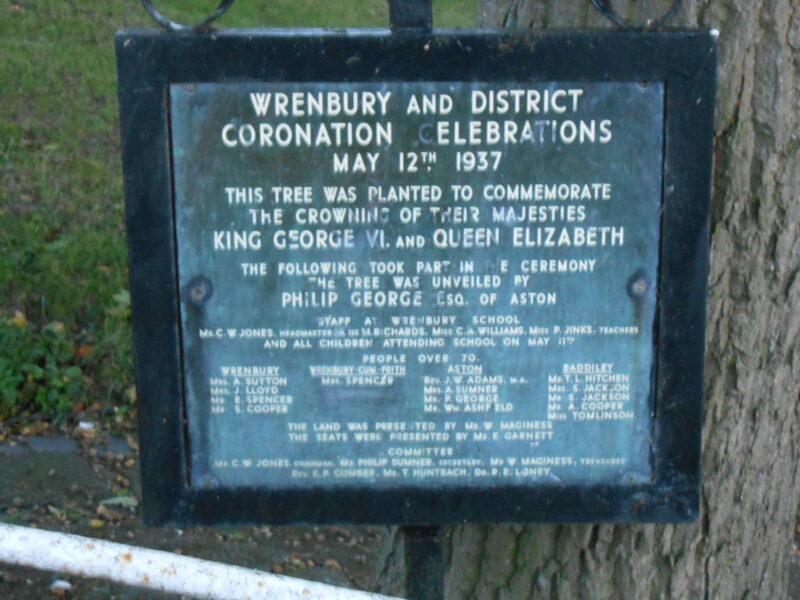 We had a couple of alternative plans – we could do a bit of time on The Weaver, or we could leave that and do it next year and detour up to Wrenbury and walk over to the Bhurtpore at Aston. 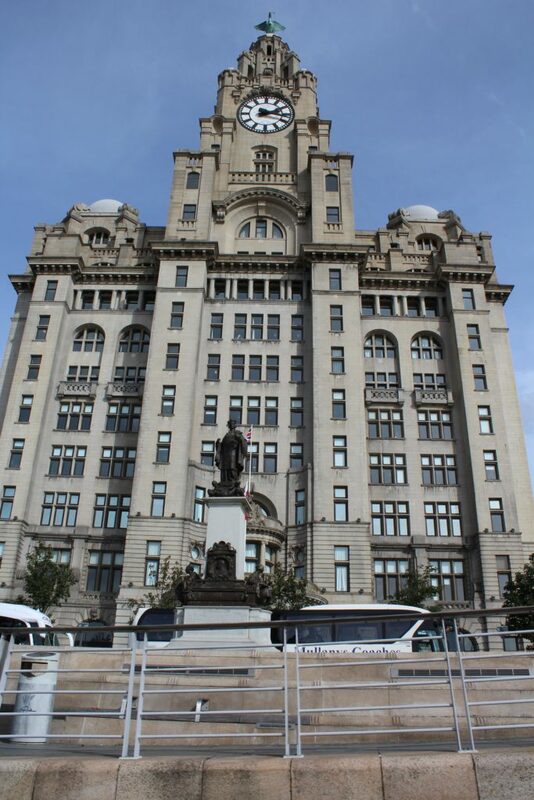 We’d heard that there had been a few problems with the lift so we decided not to do the river this time. 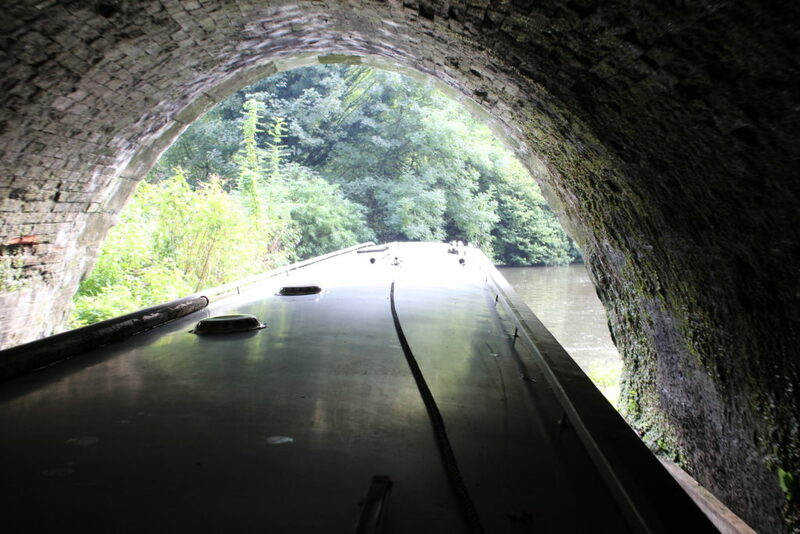 It was another cool morning with a little bit of mist, Nick had started steering but he really dislikes Barnton and Saltersford tunnels so Colin took over. 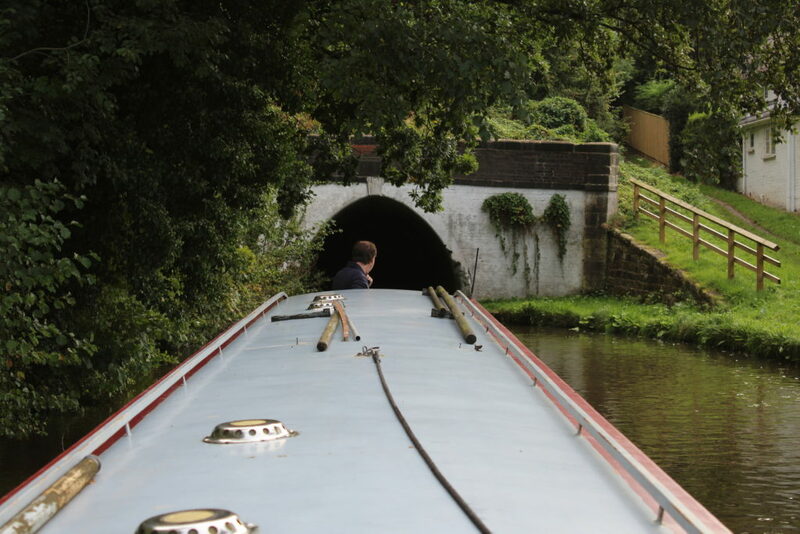 We had to wait at Saltersford Tunnel (West end) as we got there just before the time slot again – there was a boat in front of us and so we gave them a couple of minutes to get ahead of us before going into the tunnel. 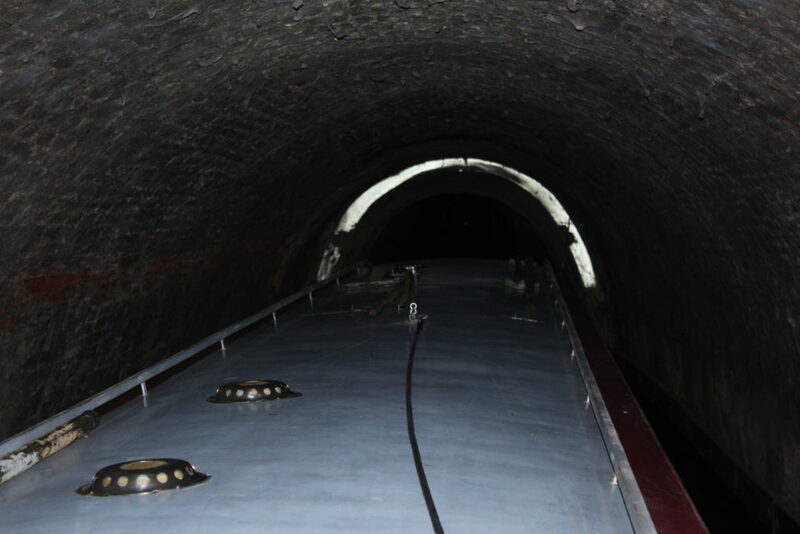 The reason Nick doesn’t like the tunnels too much is that the approach to both of them going south is pretty bad with bends in the canal right before them which means its very easy to make a mess of entering the tunnel – something that happens a lot if you look at the state of the stonework. 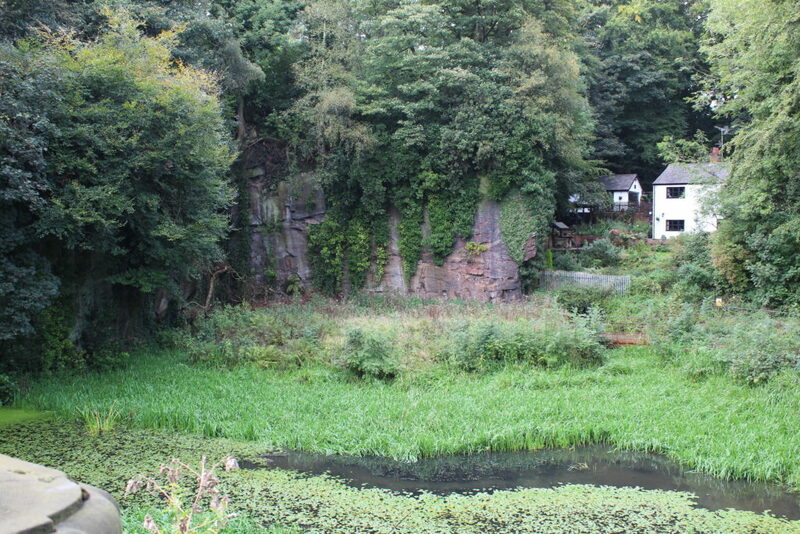 The Winding Hole between Barnton and Saltersford Tunnels had quite a few boats moored in it – and it looks like quite a good mooring. 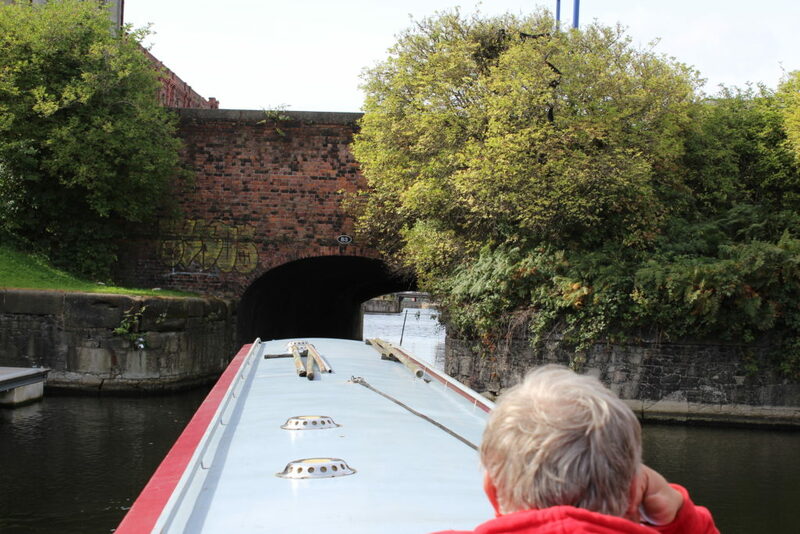 We followed the boat round the corner to Barnton Tunnel (West end) and as we entered the tunnel we snagged the radio aerial… luckily it just folded down rather than breaking off. 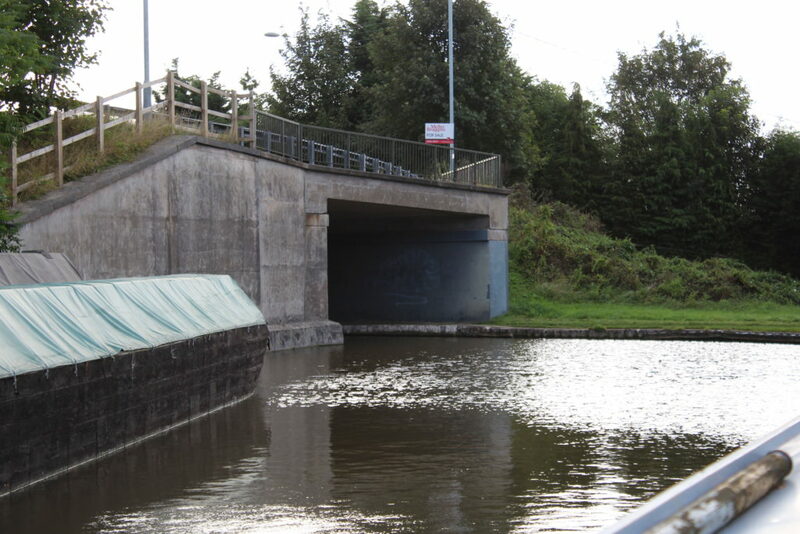 You’d hope that the stupid approaches on bends would be over but no… The canal makes a S bend on leaving the tunnel and leaves you approaching Barnton Road Bridge on a 90 degree blind bend. Today was another crew change day – we were dropping back down to three of us for the rest of the trip so we started planning where to do it. On the way out we’d dropped crew at Old Broken Cross and they’d walked to the station so we did some time table checking and worked out we could be there for lunch. As we came through ICI Works Bridge No 186 the ponds on the other side of the main road were steaming so for once the warning notices on the road were appropriate. We moored up outside the pub by Broken Cross Bridge No 184 – I’m not sure when the pub grew the “Old” moniker and had lunch. 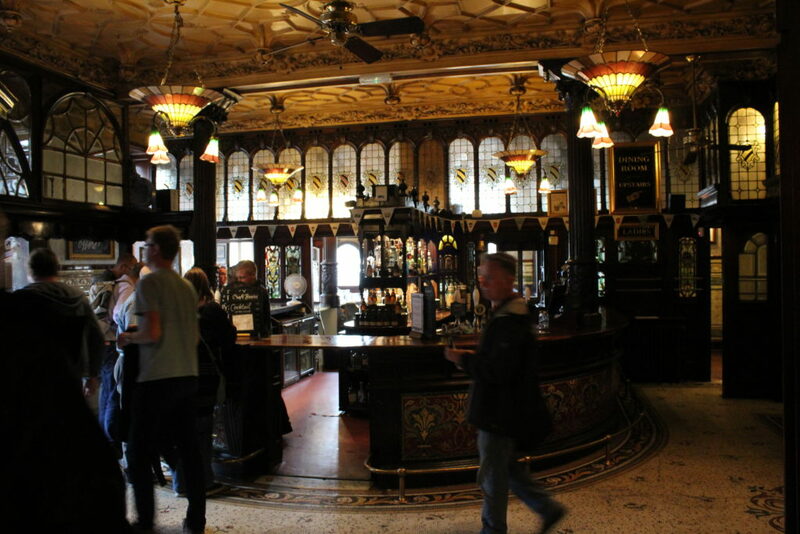 We also found The White Bear where we had a couple of pints whilst planning the rest of the day. We went back to the boat via the Tesco and cooked supper before heading over to The Kings Lock which was extremely good. It had a range of interesting “Green Hopped” beers, i.e. ones made using fresh green hops rather than dried ones. 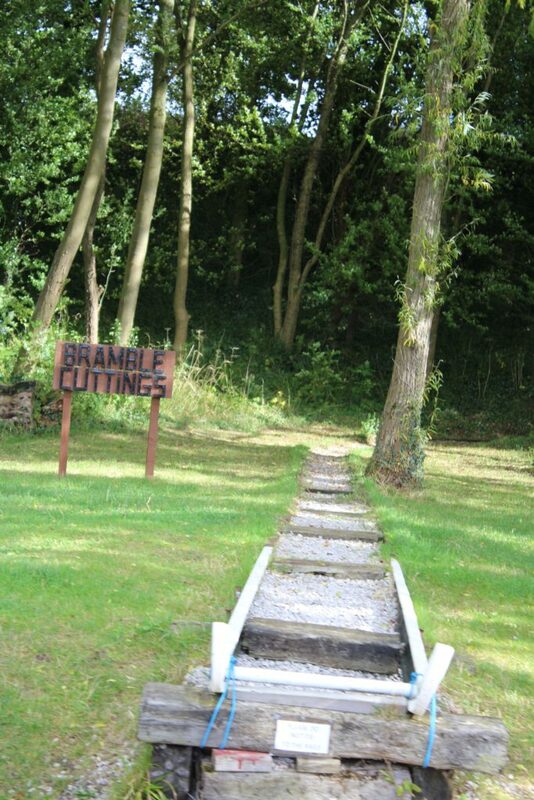 After that we walked down to The Narrow Boat before ending up at The White Bear again. 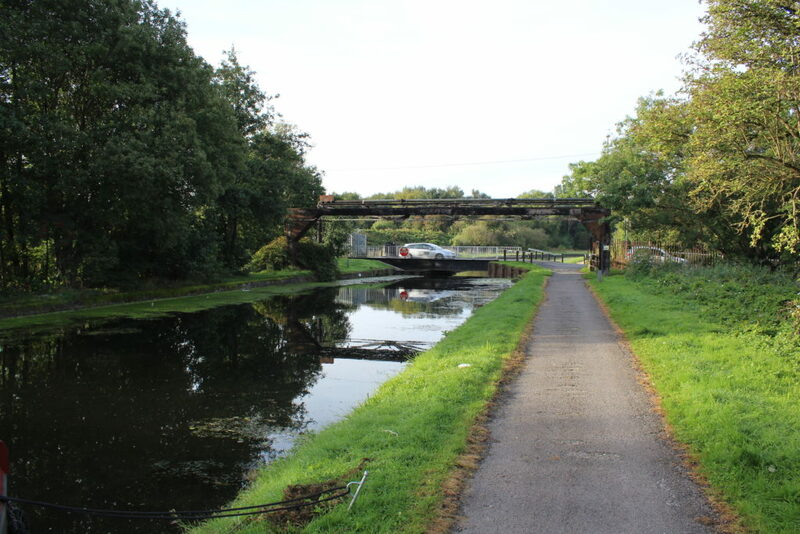 From Worsley Visitor Moorings to Dutton Stop Lock No 76, a distance of 26 miles, 6 flg and 1 lock. There were no specific plans for today, apart from being in Lymm sometime round lunch so we could pick up another member of crew. Before leaving we picked up a newspaper from the newsagents by the canal, primarily for the crossword. 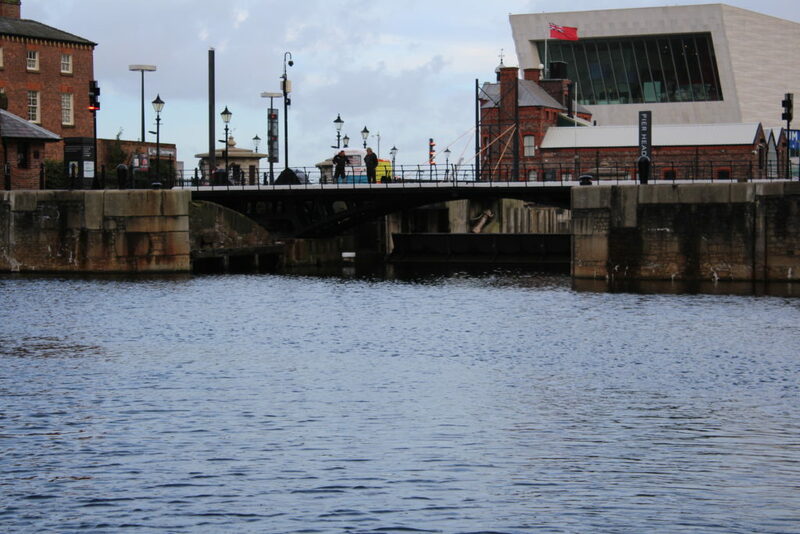 A couple of boats had cast off and left before we set off but apart from that things were very quiet. Although the weather started off OK as we approached Watch House Cruising Club it started raining – not too heavily to start with but it got heavier and heavier and by the time we got to Sale Bridge No 35 the weather was so bad that even the canoeists were sheltering under the bridge. 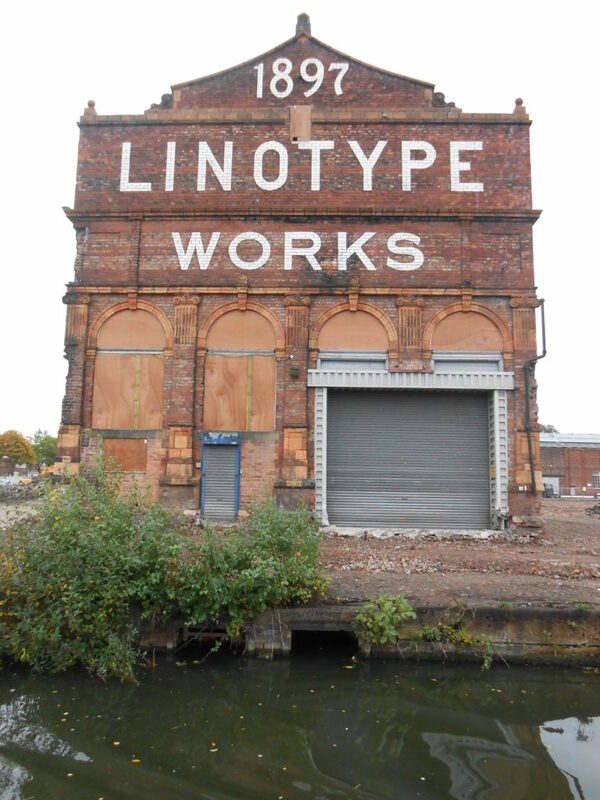 But the rain cleared off suddenly and by the time we passed the old Linotype works near Broadheath Bridge No 30 things were starting to dry off but it was quite cool. 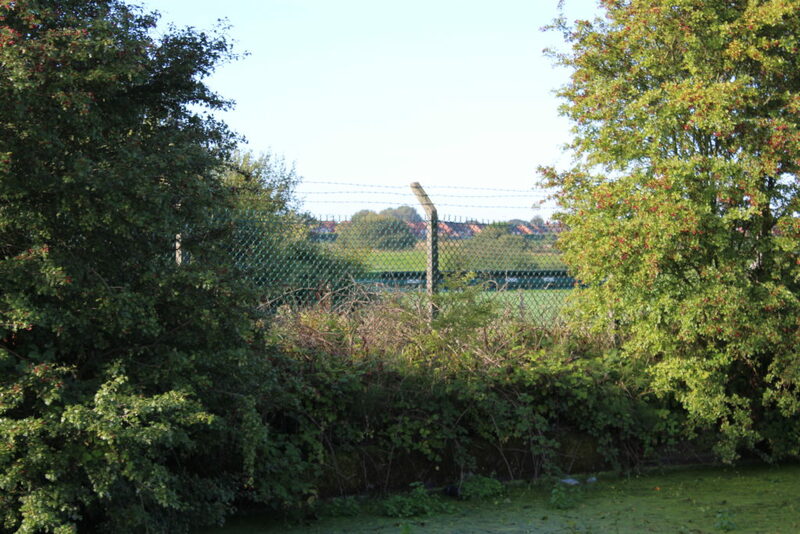 Manchester stops near Seamon’s Moss Bridge No 29 – one minute the canal is lined by houses and the next its open fields as you meander across Bollin valley. There were a few boats at the Ye Olde Number 3 Transit Moorings – but the apparently quite haunted pub that gives it it’s name is all boarded up, and I suspect that its not going to re-open. We arrived at Lymm Bridge No 23 at 12:45 and saw Mike walking over the bridge having just arrived in a Taxi from Warrington. 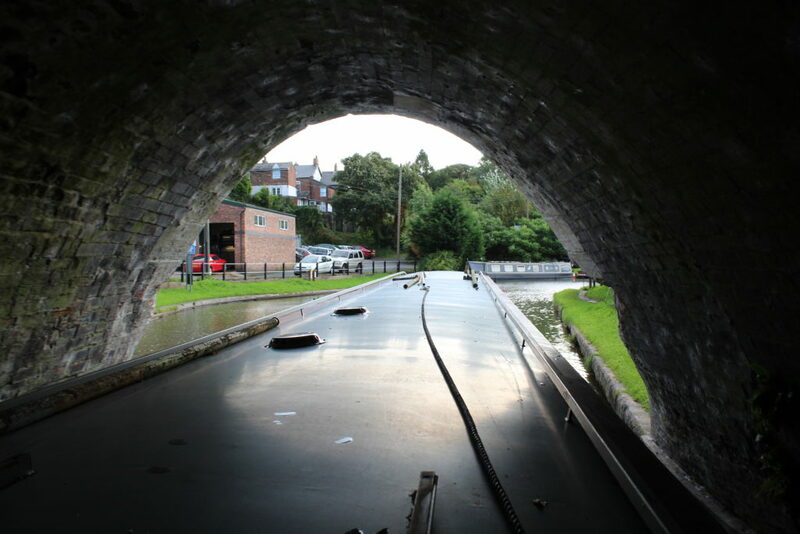 We stopped on the offside Lymm Visitor Moorings and walked to Whitbororgh Aqueduct No 22A where you can get down onto the road right outside The Brewery Tap where they’d lit the fire to take the chill off. A couple of pints later and after a quick wander round the village we set off again. 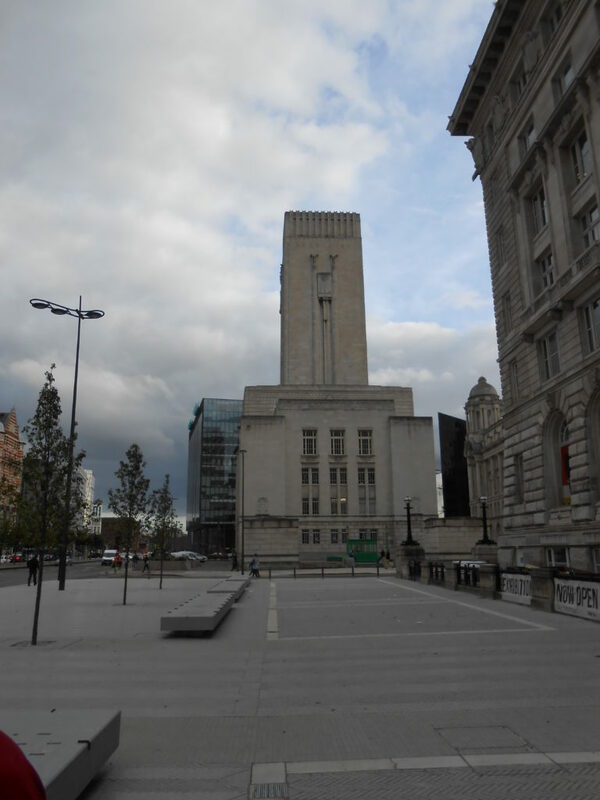 We discussed going to Runcorn for the night but as we chugged along the weather started getting worse, it got colder and the wind picked up and it got quite blustery. 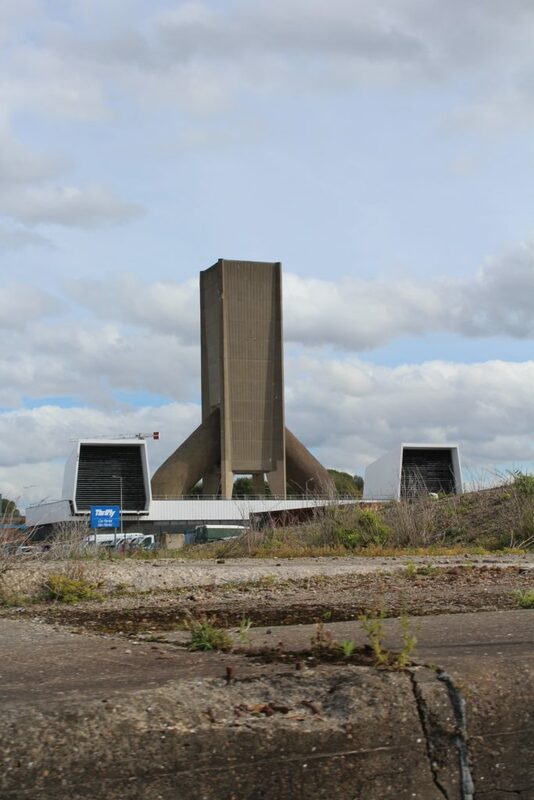 The skies were darkening as we approached Moore Bridge No 7 and a quick council of war decided that we’d skip Runcorn and instead head to Preston Brook and The Tunnel Top pub for the night. We arrived at Preston Brook Tunnel (North end) with about 10 minutes to go before the time slot so we took a chance to browse through the free books that are available in a box just outside the house. 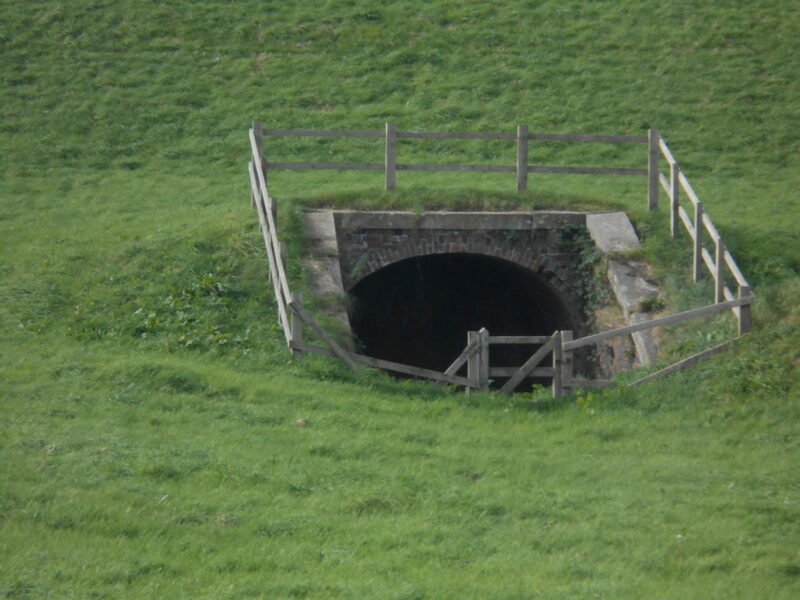 We made goodish time through the tunnel and decided that we’d go through Dutton Stop Lock No 76 and stop for the night – especially as we’d found out that The Tunnel Top Inn was running a quiz night, and we’d managed to miss every pub quiz night so far. 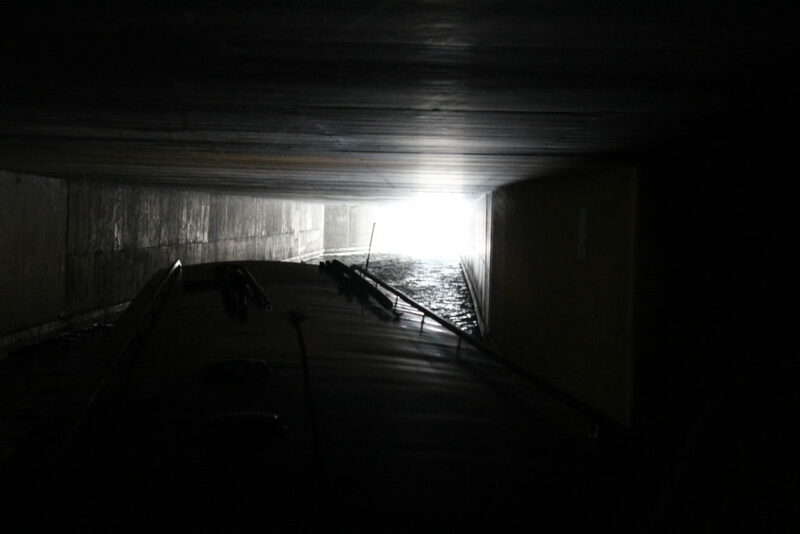 So we moored up just beyond the lock and took the path up over the tunnel – unlike a lot of horse paths this one is actually a fully tarmacked road but you’ll need to take a torch as its unlit. 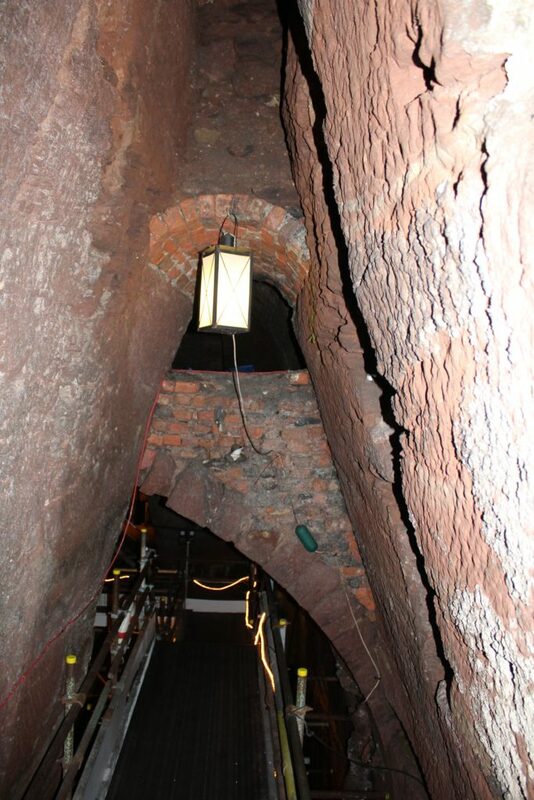 Walking up to the pub you pass one of the original tunnel vents. 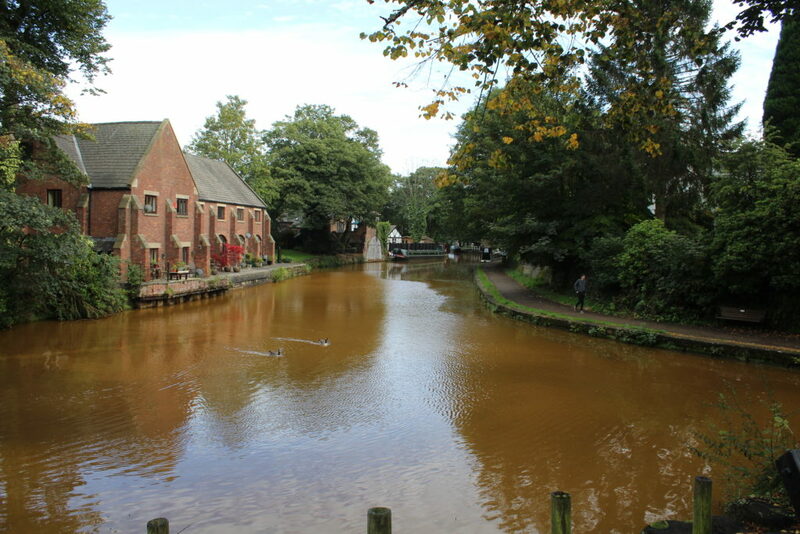 From Parbold Bridge No 37D to Worsley Visitor Moorings, a distance of 21 miles, ½ flg and 8 locks. It was a coolish, but dry morning when we cast off and made our way to Appley Lock No 91 where our extremely long anchor warp came in very handy as it allows you to work this extremely deep lock with just one person on the boat. 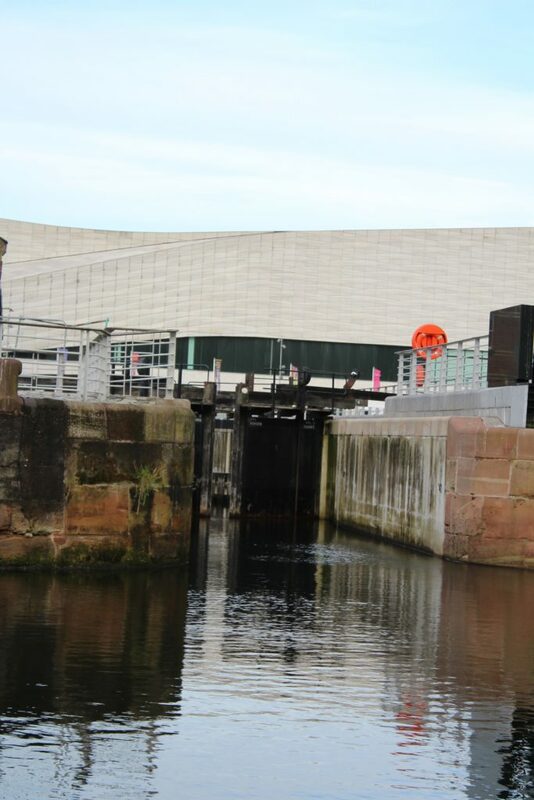 The lock is in a bit of a mess – only one of the bottom paddles works and only one of the two top ground paddles can be used (the other is padlocked shut) and the steel gates are really starting to show their age. 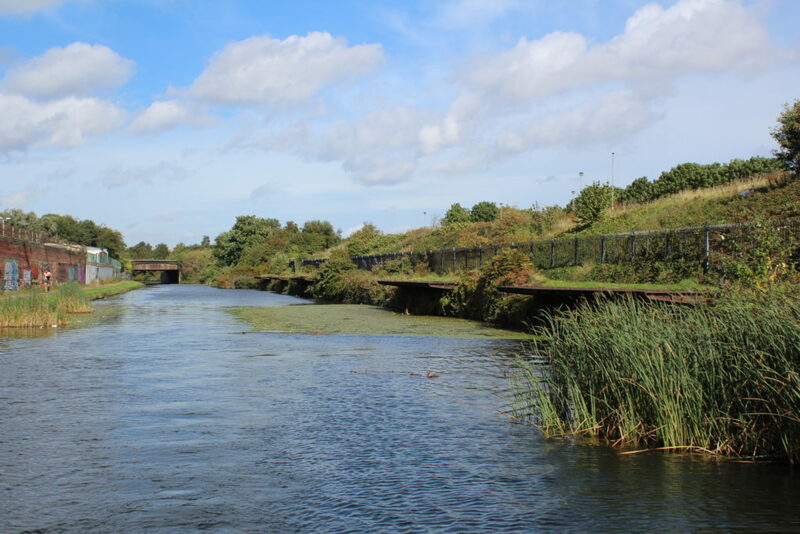 Apart from the Tar works there is just about no sign of the industry that used to border the canal – for example at Finch Mill Swing Bridge the houses occupy the site of the old glue works (which I guess might have been called Finch Mill but I don’t recall anyone ever calling it that). At Dean Locks No 90 we found another boat that was just about to go up the lock after watering, and as wide locks are so much easier to work with two boats we slipped in along side them. We found that they were going all the way through to Worsley and that they’d been through Plank Lane several times since it broke down. 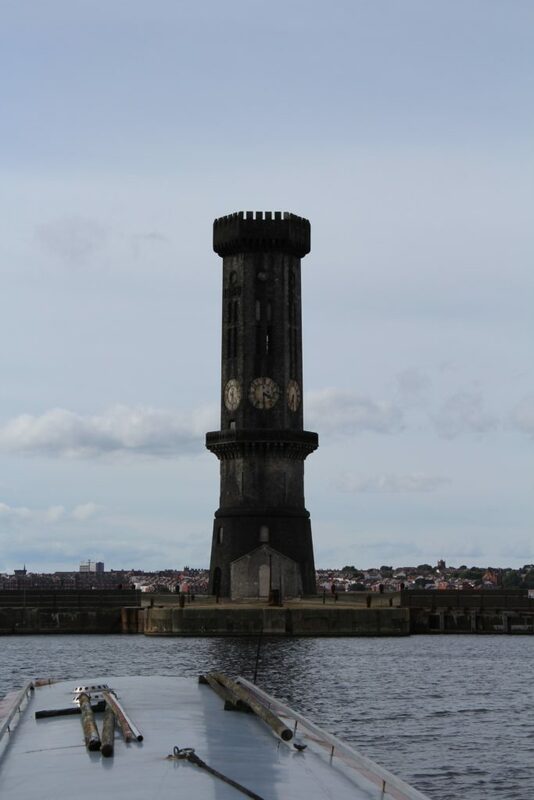 We mentioned timings and the told us that according to Canalplan we had plenty of time. We didn’t let on immediately that it was our site but we did eventually tell them. Approaching Wigan Pier there were some workmen clearing the overgrown vegetation outside the old warehouse buildings : not sure if it was the start of something big or just a small amount of long overdue maintenance. As I got close to the Orwell I sounded the horn and started the turn under Pottery Changeline Bridge and saw a boat coming the other way. I slammed the boat into reverse and opened up the throttle but the boat just went forward even faster. The person on the other boat shouted at me saying I was going too fast. I shouted back that my gears were stuck and I’d sounded my horn so why hadn’t he.. he just swore at me. We actually missed each other and I dropped the boat to tick over. Looking under the deck I saw that the gear shift cable had come loose from it’s mountings and so, avoiding a bunch of kayakers I drifted the boat over to the side. Nick hopped on and we determined that the gearbox was still working and so we tightened the mountings up and found that it was not really going into forward very well (we’d had problems with it going into forward from time to time) . worked out way through Dockyard Lock with Nick basically sitting with his feet by the gear box and kicking the gear shift lever up so we could go forward. We’d also noticed that, once again, the bracket that holds the CAV fuel filter on had sheared so we made a temporary running fix with several cable ties and at the same time we wound the adjusters on the gear lever cable to its very end and tightened everything up as tight as it would go…. after 15 years I guess there is very little left on the forward gear clutch plates so we’ll probably have to get a new gearbox this winter. The pound between Poolstock Top Lock No 1 and Poolstock Bottom Lock No 2 was very low and the other boat bounced off something quite solid in the middle of the channel (it actually made their boat lean over). Leaving the lock we checked the time and knew we had plenty of time to get to Plank Lane before 2pm, and we actually made it with nearly an hour to spare which gave us time to put in a new, temporary, bracket for the CAV filter, so we could get the boat back to Market Drayton. The bridge opened a few minutes late, and there was a bit of jockeying for position in the old lock narrows as C&RT wanted to keep the bridge lifted for as short a time as possible. 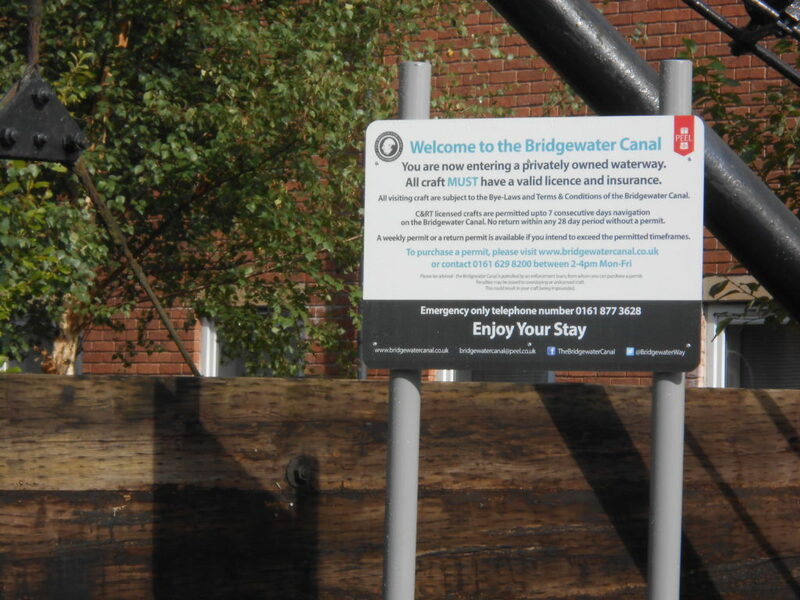 Nice one Peel Holdings… “Enjoy your stay” now basically means C&RT boat owners power through the canal as fast as possible to avoid being harassed by “Sonny” their self titled “enforcement officer”… I’m sure the local businesses love you for it…. 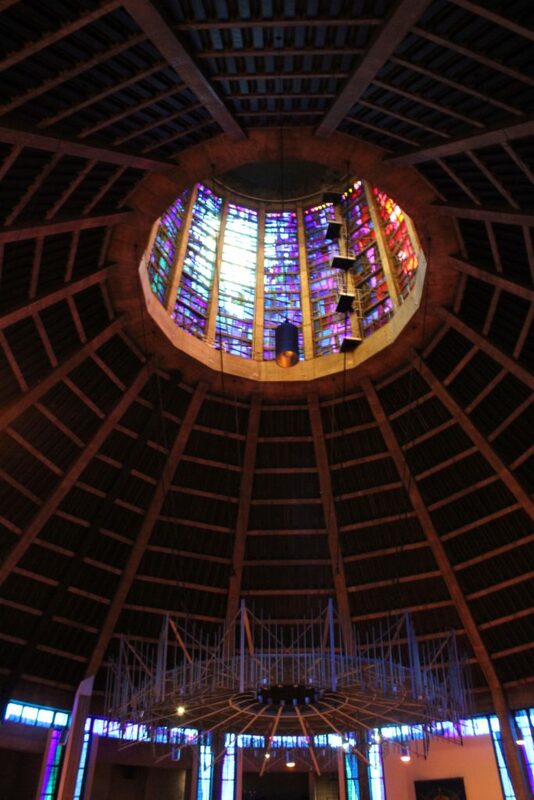 We’d done some calculations and worked out that we’d not be able to make it into the centre of Manchester so we took our time. 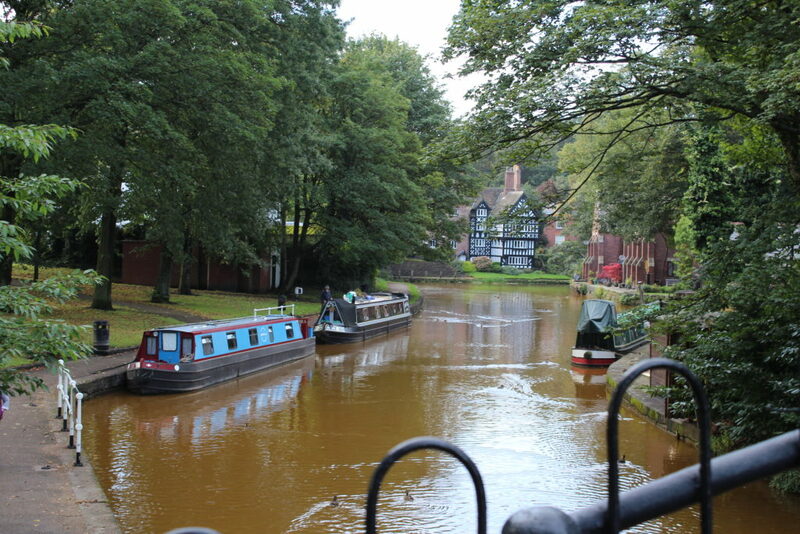 As we came up to Worsley Bridge No 52 we could see a hire boat attempting to turn in front of the Packet House… they weren’t having much luck as their stern was in towards the delph where there is very little water. 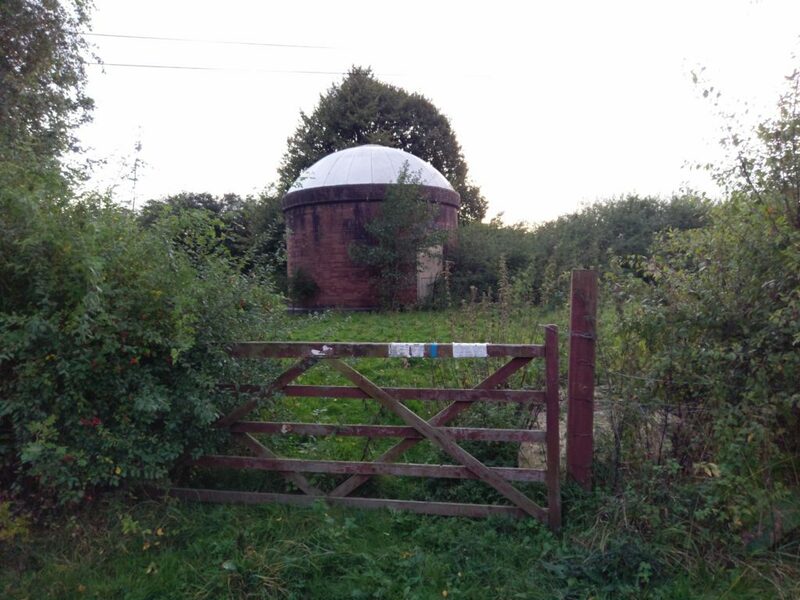 From Halsall Warehouse Bridge No 25 to Parbold Bridge No 37D, a distance of 9 miles, 1½ flg. We woke up and it was raining, and it rained for pretty much most of the day. So we changed our plans for the day. 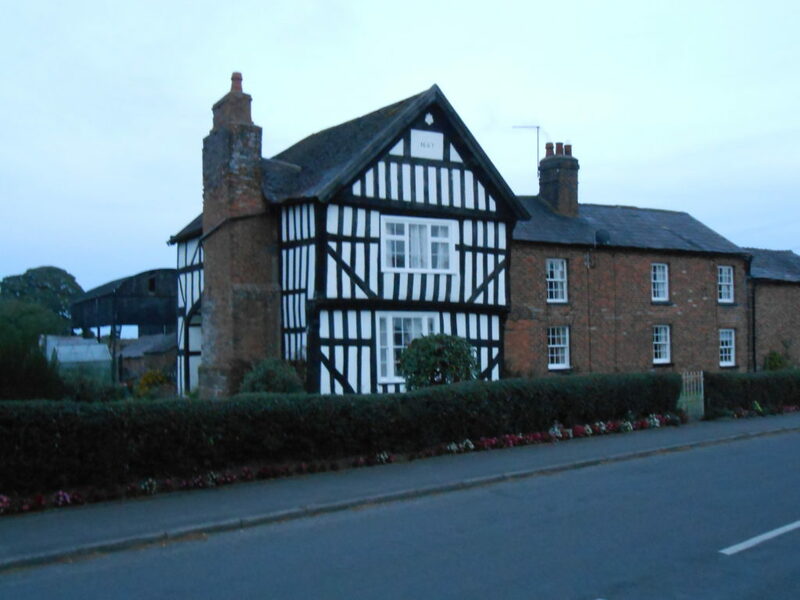 Rather than doing the Rufford Branch again we decided to take it easy and just visit some pubs along the way. Scarisbrick Marina has diesel, calor and pump out facilities and it has a good looking cafe (who also handle the payments for anything you’ve bought from the marina ). You might need to wait for a while for the marina staff if they are not there as they also run another marina down at Rufford, but we didn’t mind as we weren’t in a hurry. We made steady progress to Burscough Bridge where we pulled up just on the Parbold side of the services moorings and walked down to The Hop Vine for a couple of pints. The pub was doing a roaring trade in what looked, and smelled, like very good lunches and, considering the weather, was quite busy. 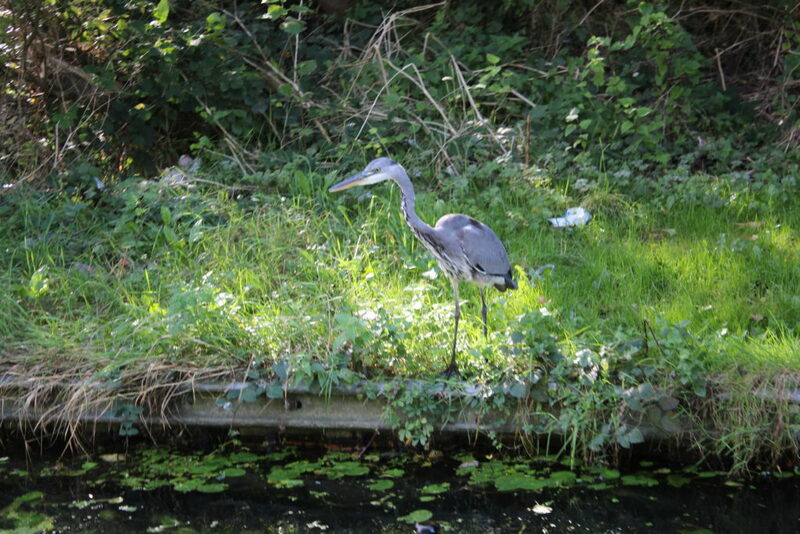 Wandering back from the pub we saw a fisherman loosing control of his rods – he had about 4 out and whilst he was scrambling for the one that was beeping he failed to notice the one that was whirring away as the line got dragged down the canal by a passing boat. We cast off, with our next stop, The Ship, only a short distance away. We moored just beyond Glover’s Swing Bridge No 33 and walked down the road to the pub. The pub had changed some of its beers since we stopped there just a few days earlier and the ones they had were in good form. It had actually almost stopped raining by the time we left the pub and so we made our way in the gloomy twilight to Parbold where we visited The Windmill and The Railway. 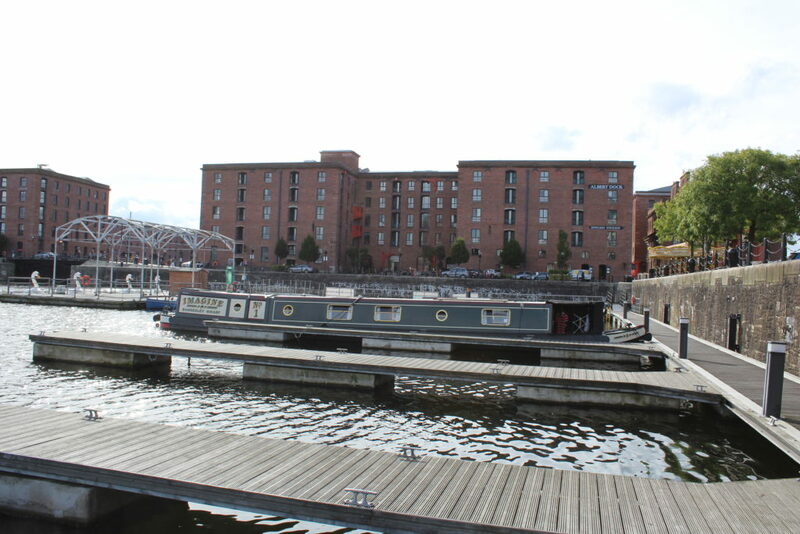 From Salthouse Dock to Halsall Warehouse Bridge No 25, a distance of 19 miles, 4½ flg and 6 locks. 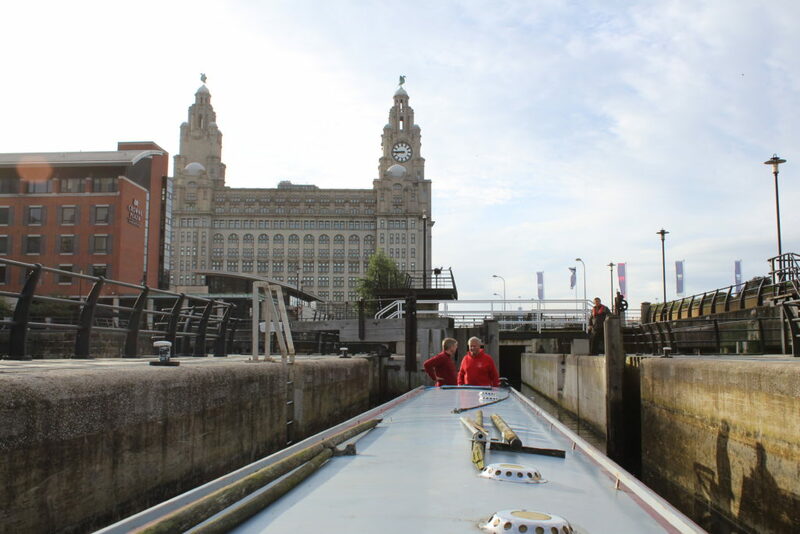 It was a pleasant morning when we got up early so we could be at Mann Island Lock No 6 by 8am. 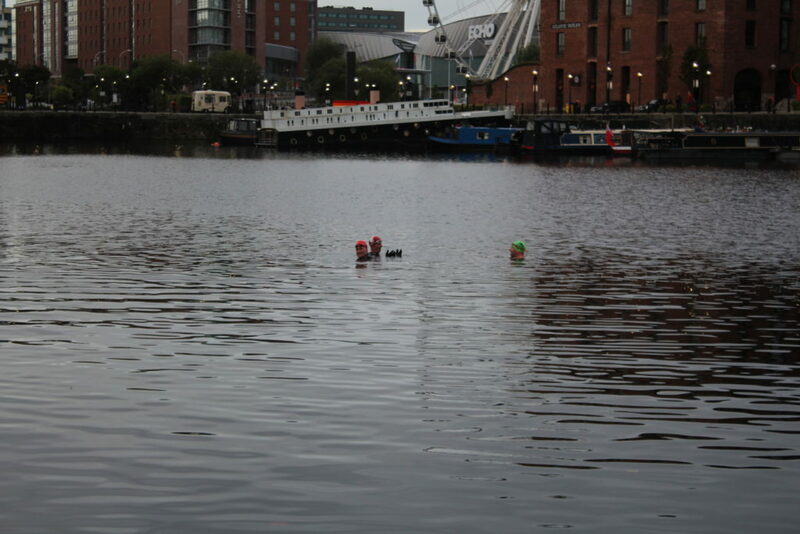 Such a pleasant morning that people were swimming in the docks. One of them wasn’t even wearing a wetsuit (or at least he wasn’t wearing a top), and the jellyfish were still plentiful. 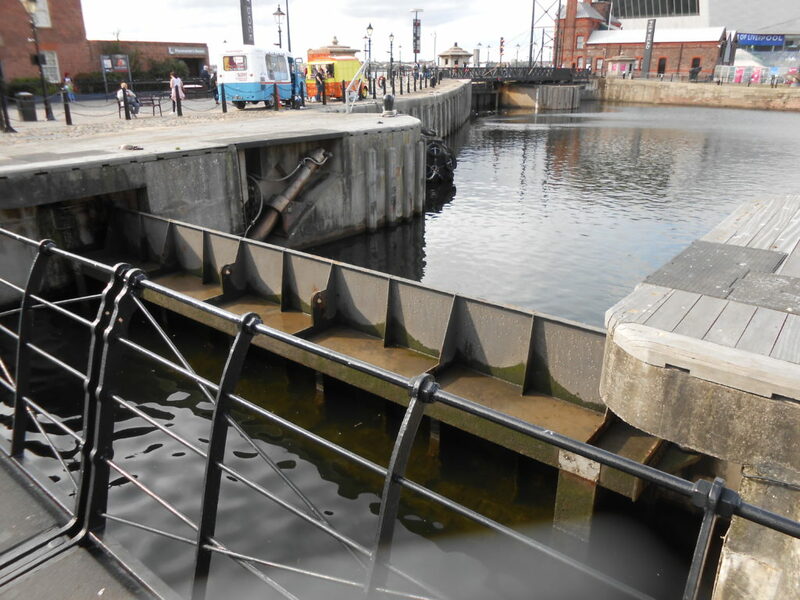 The lock is actually very shallow but has a set of reversed gates at the Canning Dock end – I assume its to handle the water level in the dock being significantly higher than it was. 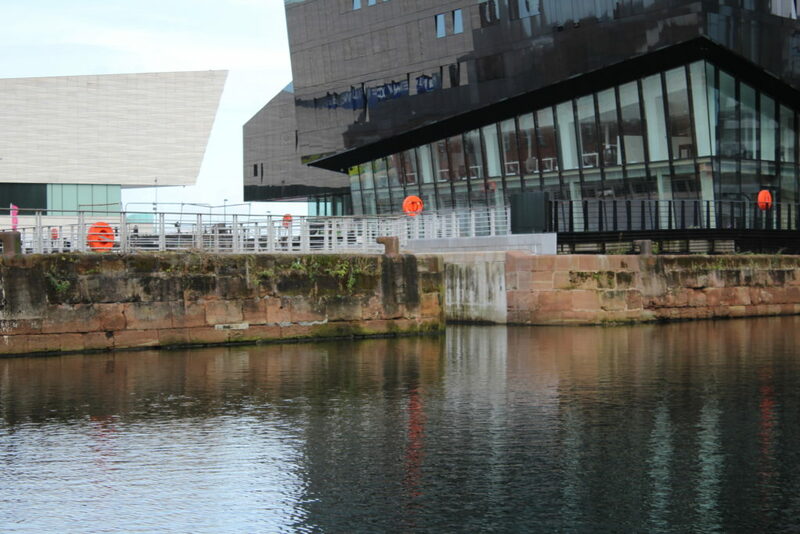 So we assume its some sort of aeration system for the large volume of pretty still water the docks contain. 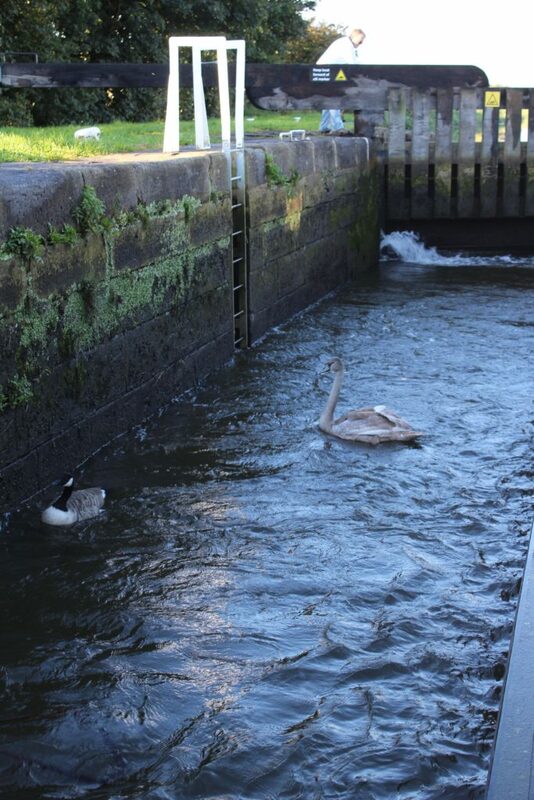 We used our ropes going up the locks but they were pretty calm and we didn’t really need them but…. 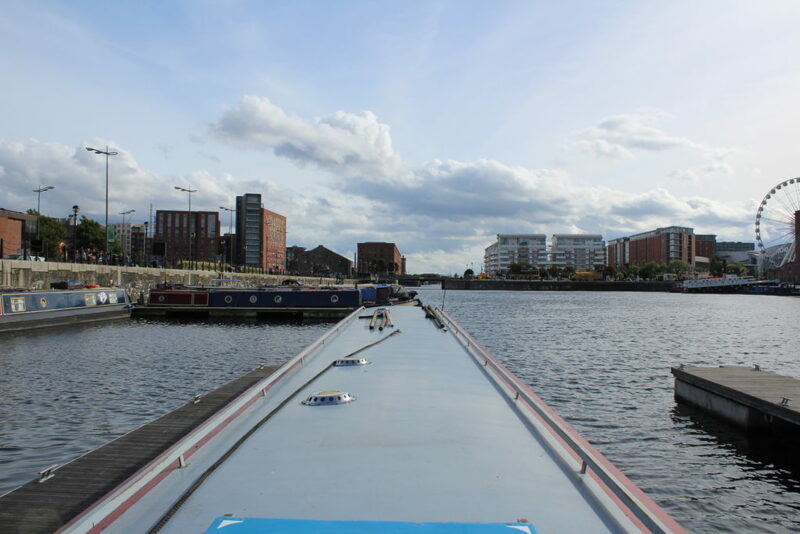 We got up the locks quite quickly without C&RT assistance – they were busy working the other boats, who had less crew, behind us and we were passing under Stanley Dock Pipebridge and turning left back onto the main line of the canal. We made good time to Litherland Footbridge where we stopped at the C&RT yard and popped into the Tesco to pick up some supplies. We had to wait a bit at Netherton Swing Bridge No 6 for the other boats and by the time we got to Hancock’s Swing Bridge No 9 we seemed to be the only boat moving. 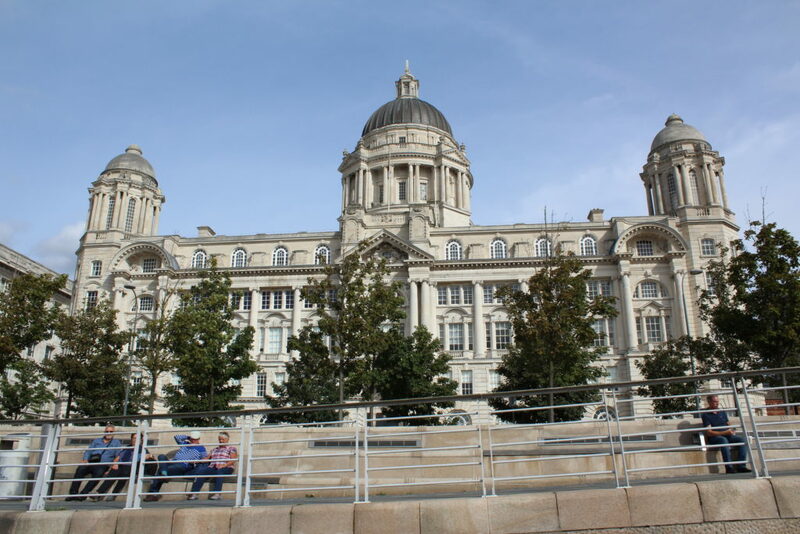 No boating today – today was a day spent wandering around Liverpool. 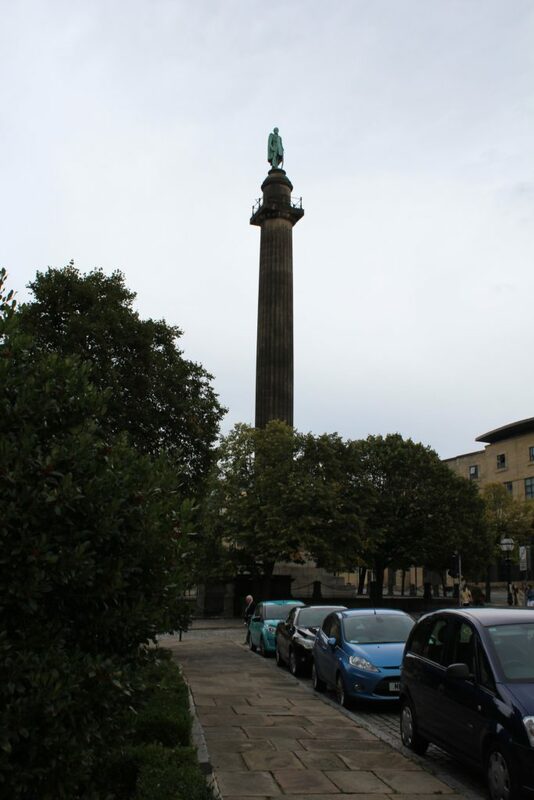 Nick was a student here back in the 1980s and he kept remarking how much things had changed. 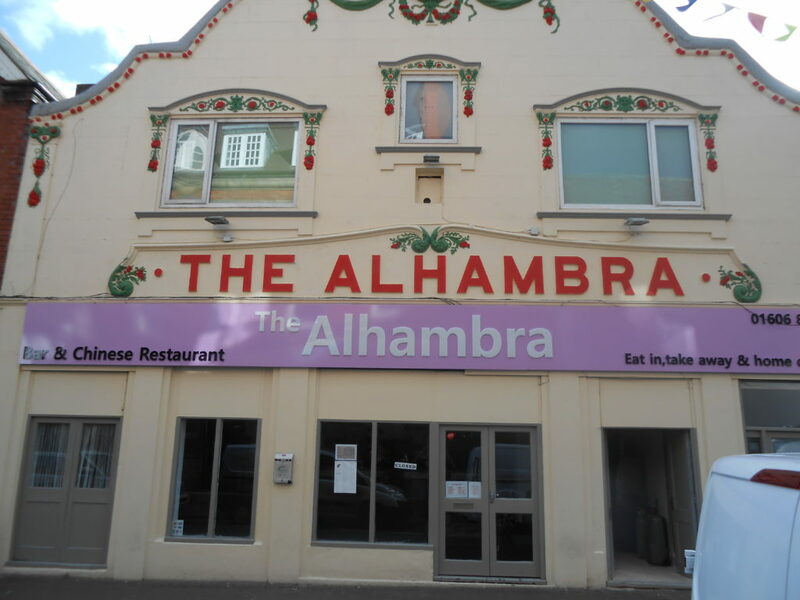 I used to visit Nick quite a bit and there was a great little transport cafe just round the corner from the Queesway Tunnel entrance that did typical truckers breakfasts and large mugs of tea of out mismatched mugs…. 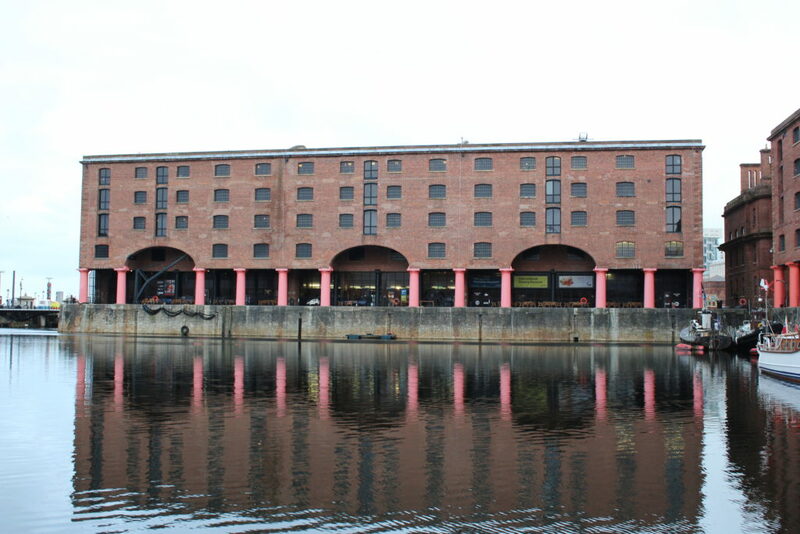 Like the Kingway Tunnel this tunnel also has a ventilation system – however this one is disguised as a building down on the water front. 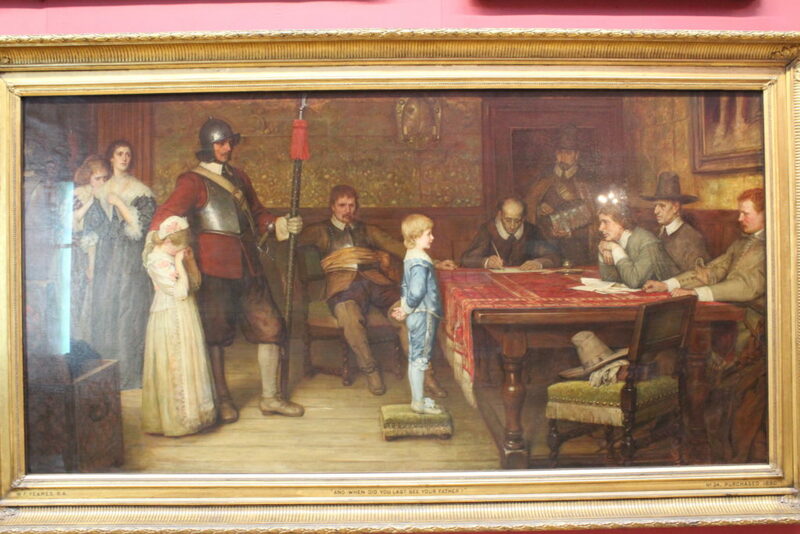 The Walker Art Gallery has several famous paintings in it – the most famous of which is “When did you last see your Father?” but has a lot of other interesting pictures and exhibitions, and is well worth a visit. 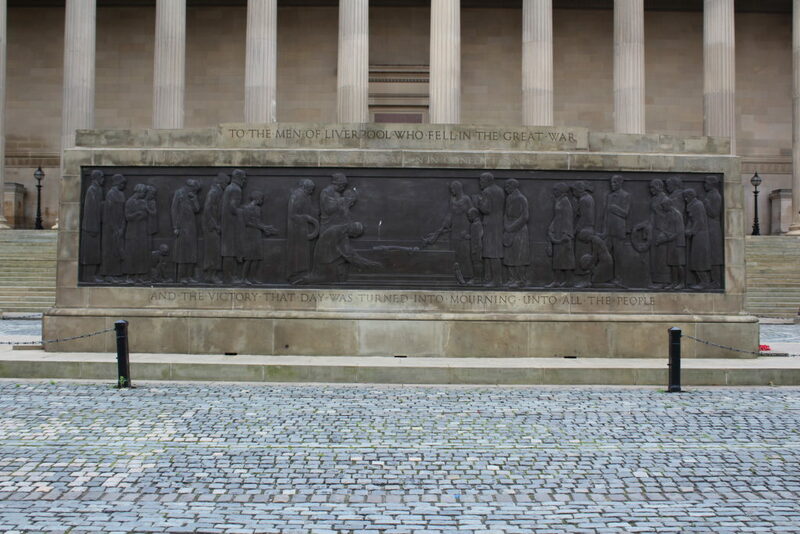 Outside the Walker Art Gallery is a square which contains a large monument to Wellington. 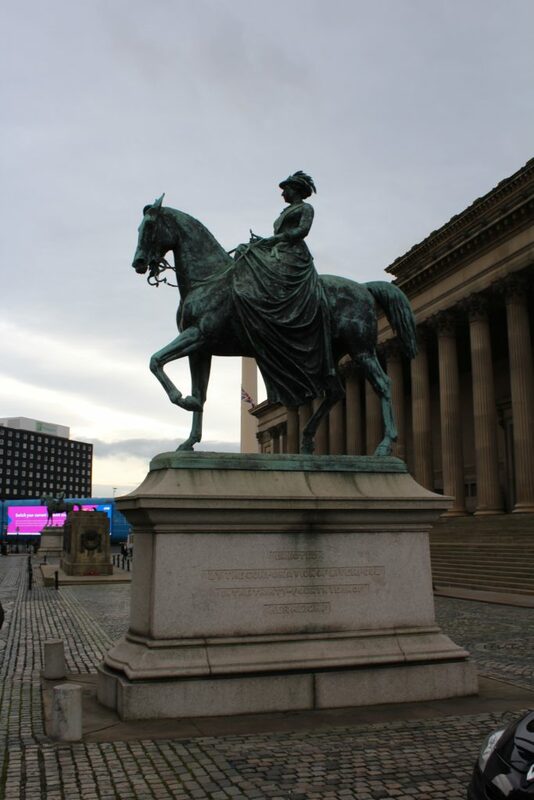 Leading down from there you get to St George’s Hall with its statues of Queen Victoria and Albert. 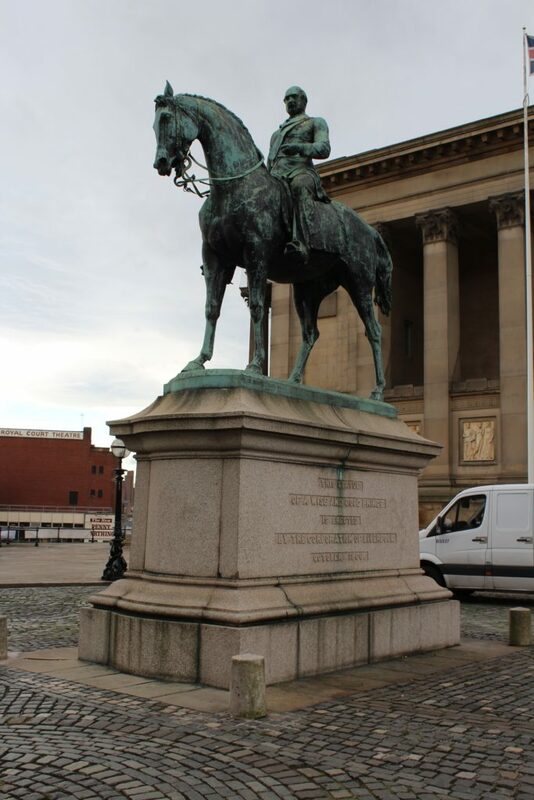 Between the two statues is a war memorial. 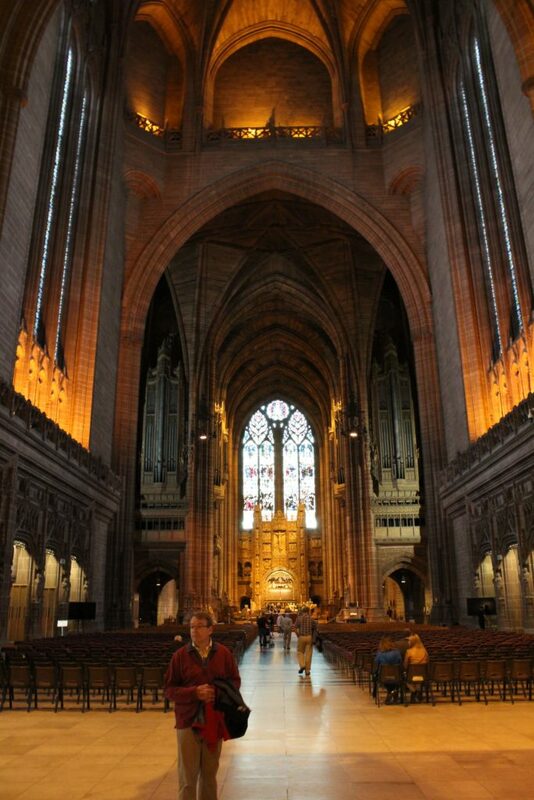 Apart from the Beatles Liverpool is famous for its two cathedrals – situated basically at each end of Hope Street. 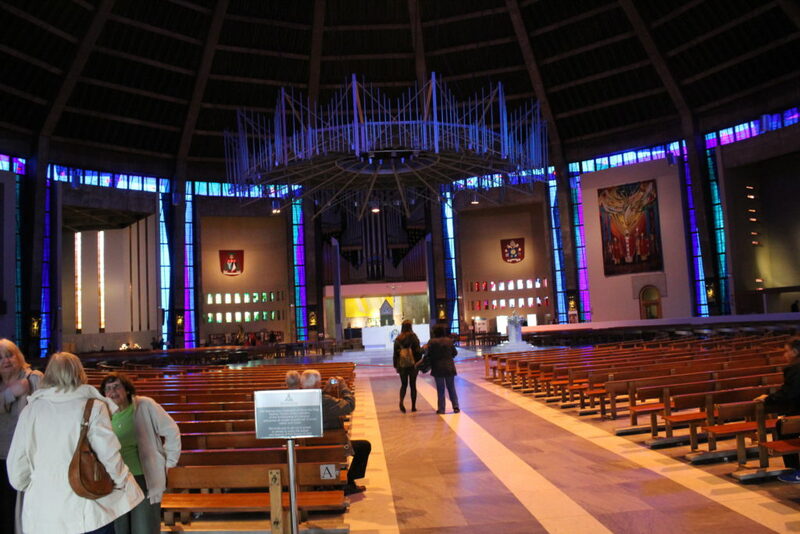 The Catholic Cathedral was originally going to be the second largest church in the world, and the one with the biggest dome, but they only built the crypt before construction was halted by the second world war. 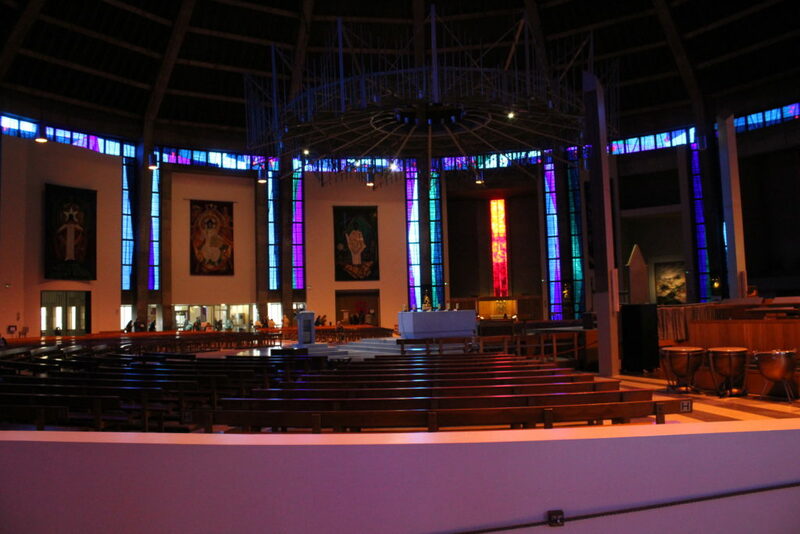 The current cathedral stands on top of the crypt and sits well within the boundaries of the original cathedral floor plan. 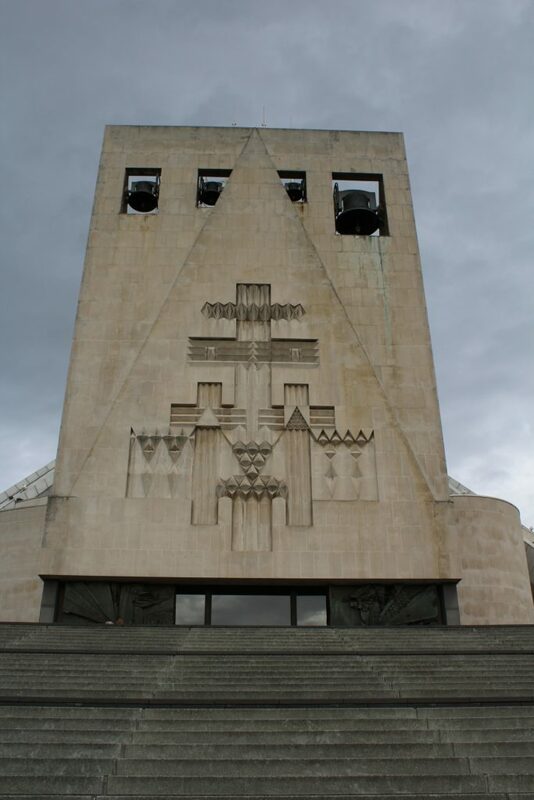 Above the main entrance to the cathedral stands what is basically the bell tower. 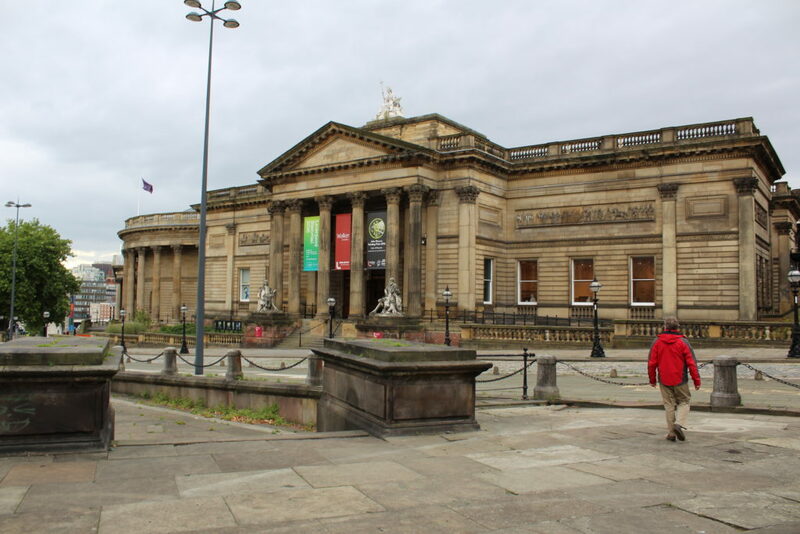 Heading down the steps takes you to Hope Street which contains The Everyman Theatre, Philharmonic Hall and the “Philharmonic Dining Rooms”. 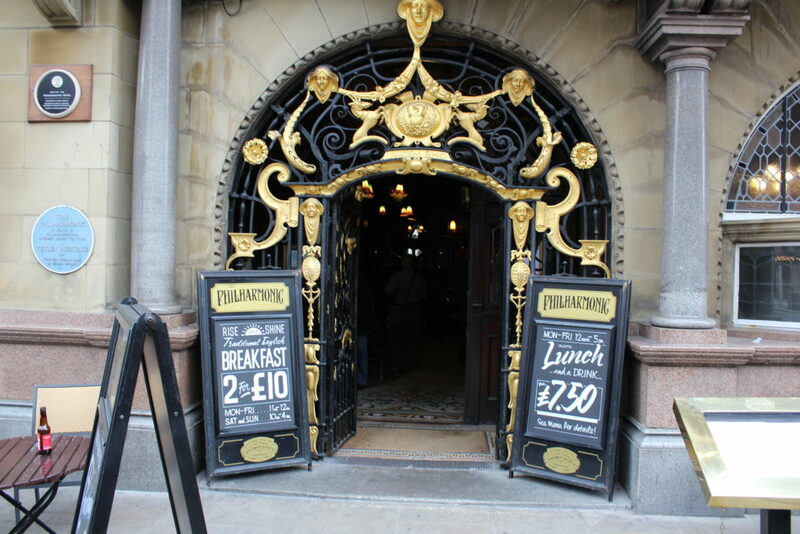 The “Phil” has to be one of the most ornate, but practical, pubs I’ve been in. 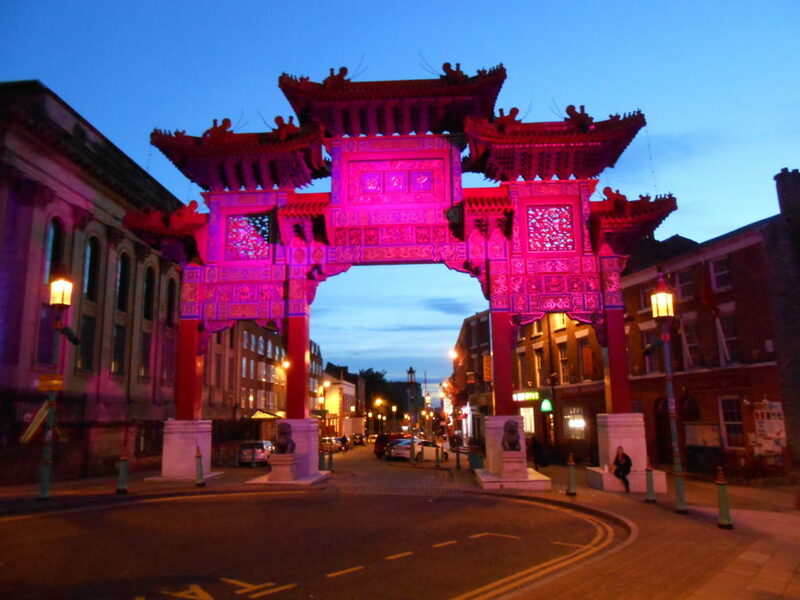 The gent’s toilets are something not to be missed either! 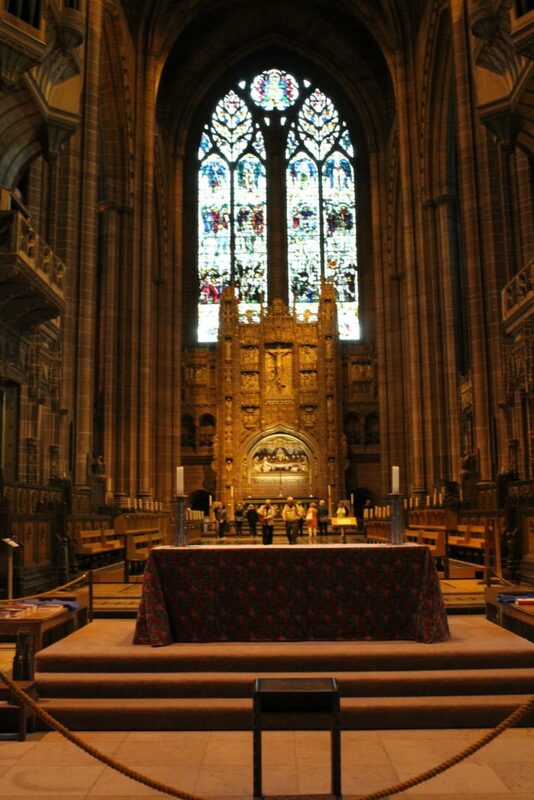 At the other end of Hope Street lies the Anglican Cathedral. 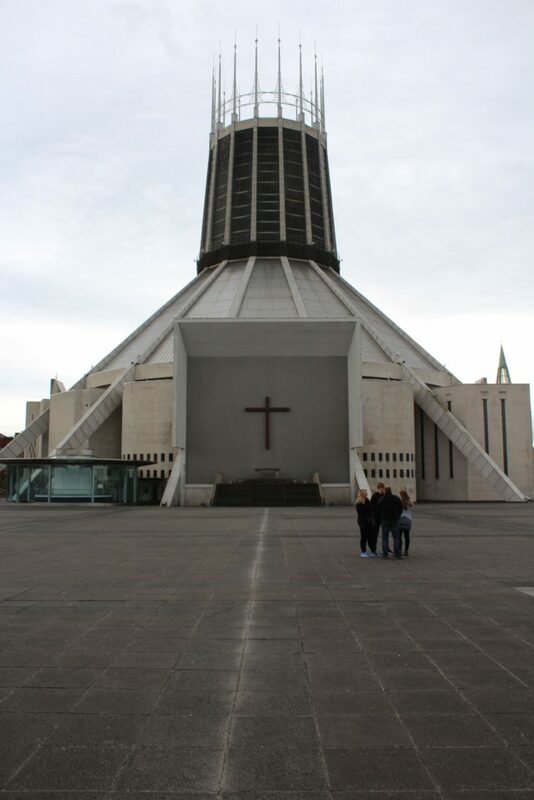 Like the Catholic cathedral this was quite a late build and was only actually finished in the late 1970s. 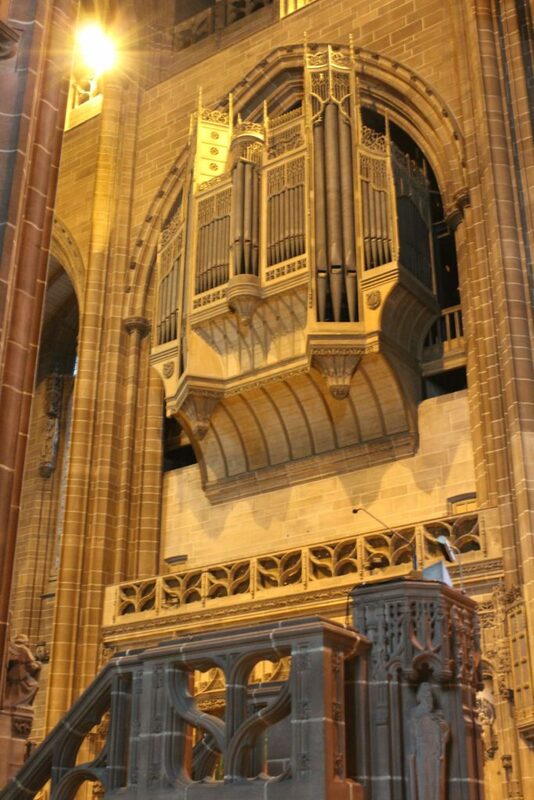 Again like the Catholic Catherdal this one is huge and is the fifth largest cathedral in the world but in terms of length is in fact the longest at 207 yards. 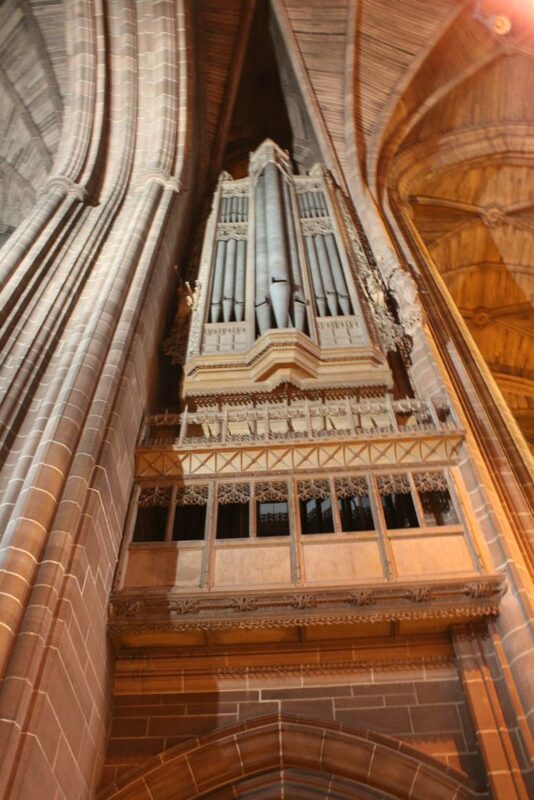 The Organ is the largest in the UK and it’s collection of pipes is quite impressive… there are 10,268 of them. 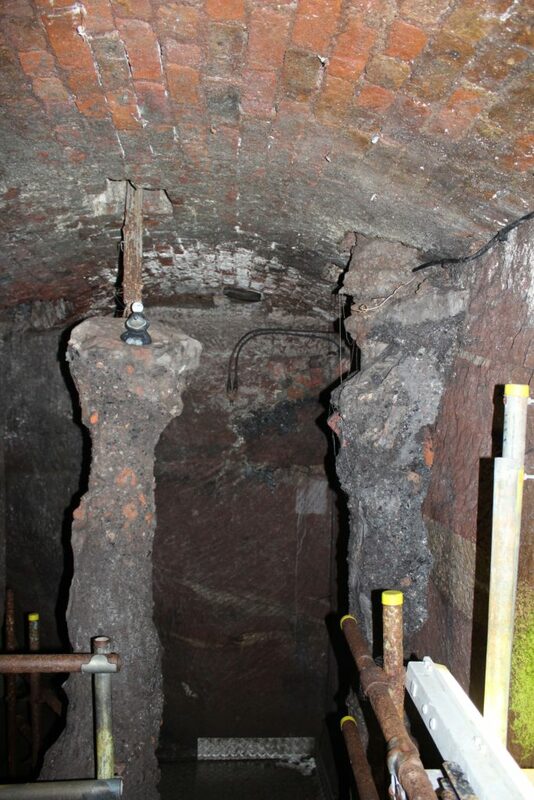 We also wandered up to The Williamson Tunnels – you only get to see a tiny bit of a couple of them but its a fascinating insight into something that is quite big and almost unknown about. 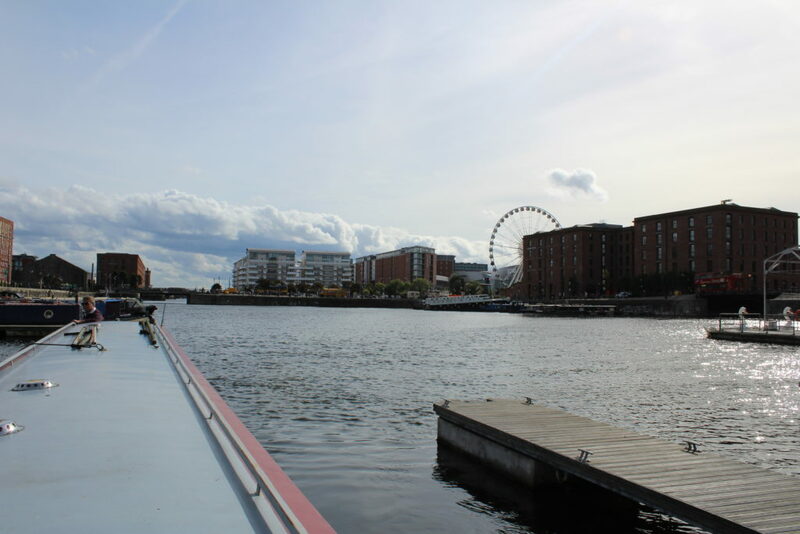 From Lydiate Winding Hole to Salthouse Dock, a distance of 14 miles, 5 flg and 6 locks. 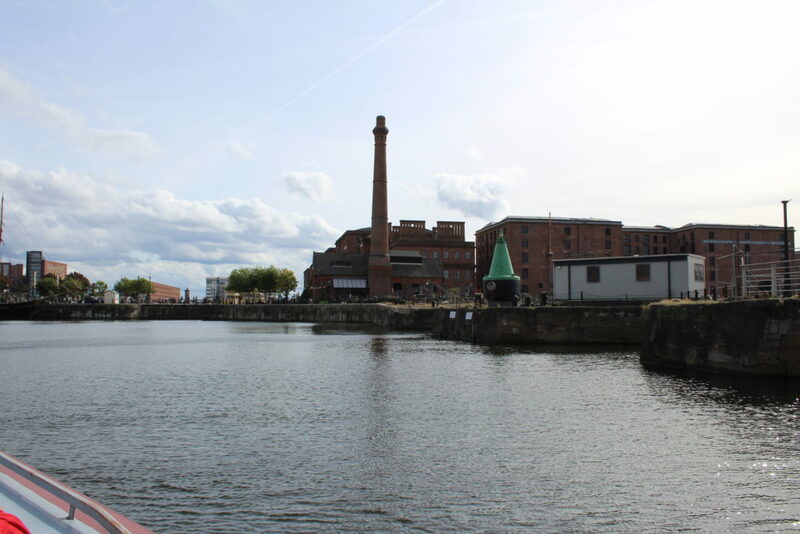 We made an early-ish start, not because we were behind schedule but because we had to be at certain places at certain times and with 5 swing bridges in a few miles of canal it’s better to be safe than sorry. 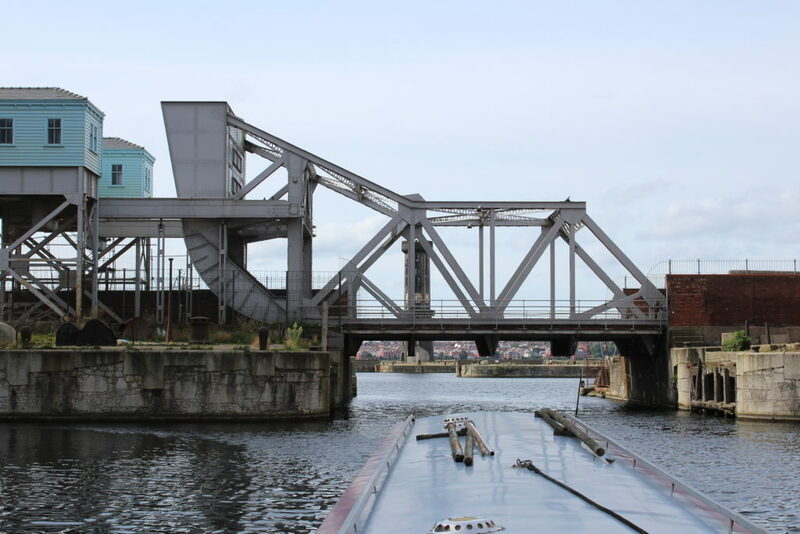 The swing bridges that you have to operate are a complete mix – from a completely manual one held shut with an anti-vandal key, through one which has barriers and hydraulics but has to be swung manually (Bell’s Swing Bridge No 16 ) to fully automatic (Maghull Hall Swing Bridge No 12 ). We arrived at Hancock’s Swing Bridge No 9 at about 9:00am leaving us plenty of time before the bridge was swung for us at 09:30. Sitting there watching the traffic you could understand why they don’t let the bridge to be swung at any old time. 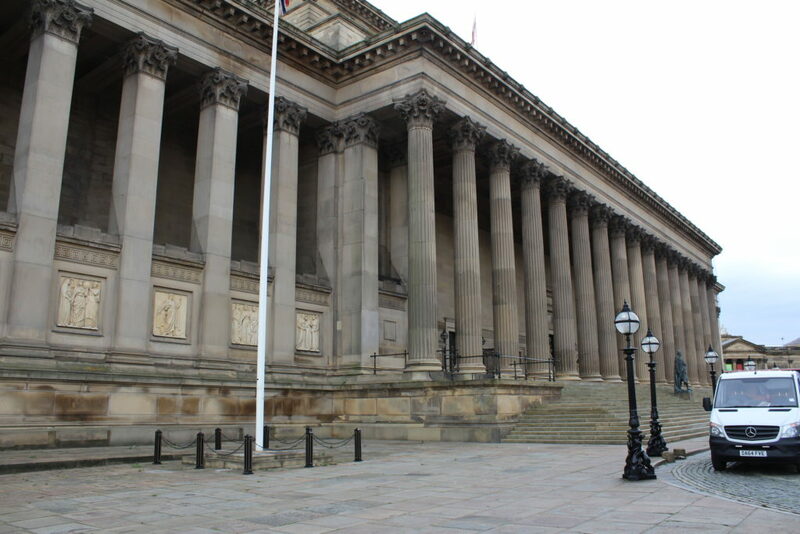 It used to be that the offside bank along side Aintree Racecourse was pretty open and we did moor of the offside once to watch the Grand National – however you’d not be able to do that now. The water was remarkably clear and although there was some surface weed it didn’t cause problems with the prop and there was just about no floating rubbish. There was, however, a lot of wildlife. We made pretty good time to Netherton Swing Bridge No 6 where the same C&RT crew were there to let us through. 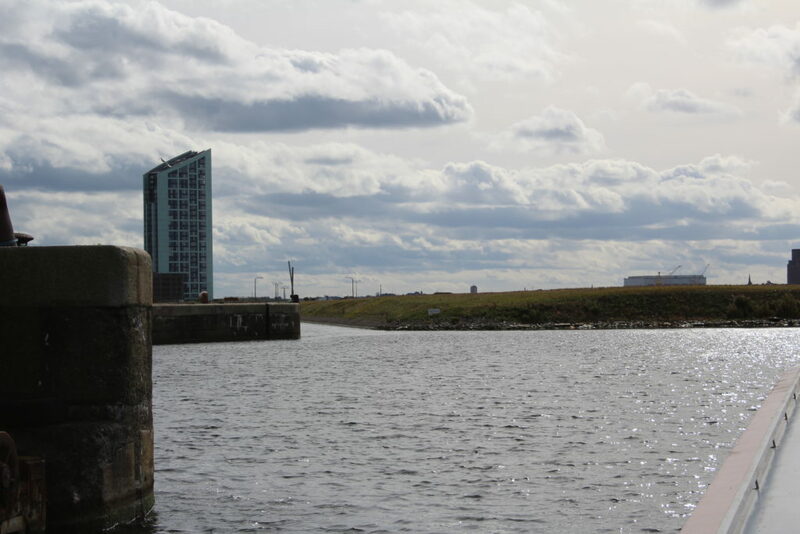 The canal continued to be surprisingly rural and it was hard to believe that you were only a few miles from the centre of Liverpool. In fact in some places it felt more like the open countryside. Just by Sandhills Station Bridge No F there are some quite high cast iron platforms which we assume is all that is left of some sort of loading bay where something (coal?) was either dropped into shortboats or was scooped out. 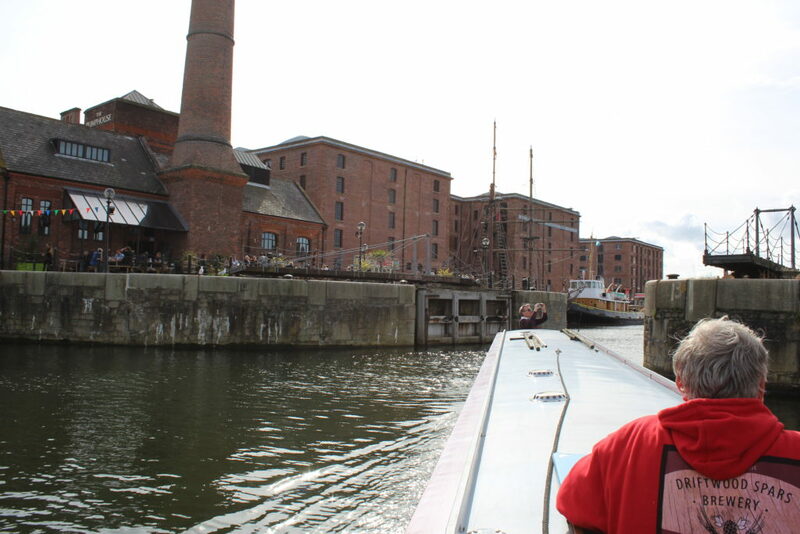 We got to Stanley locks and found “The Pride of Sefton II” sitting in the top lock waiting to go down. 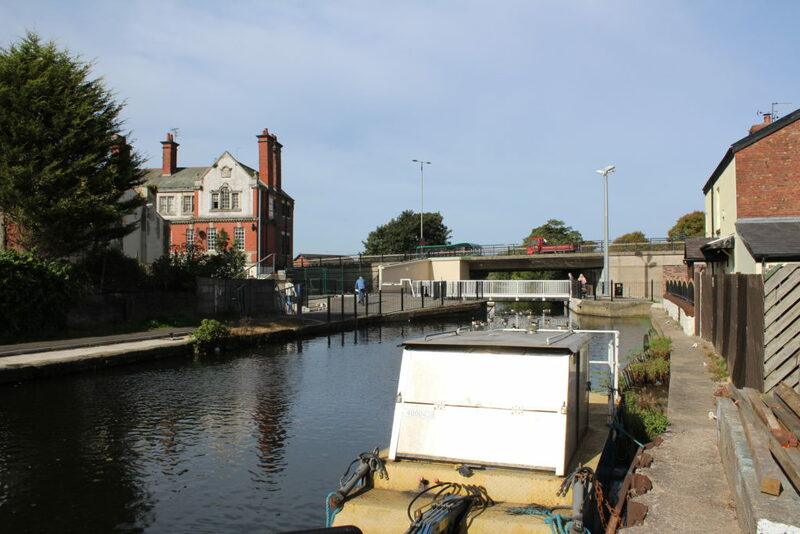 There were several C&RT people there and they worked us through the flight with us following their lead – they explained the route through the docks and told us about Sid’s cut (Sid was one of the team working the locks). It all sounded a bit complicated and involved keeping buoys to the right and then keeping them to the left but they told us that they hadn’t lost anyone yet and it wasn’t going to happen on their watch. 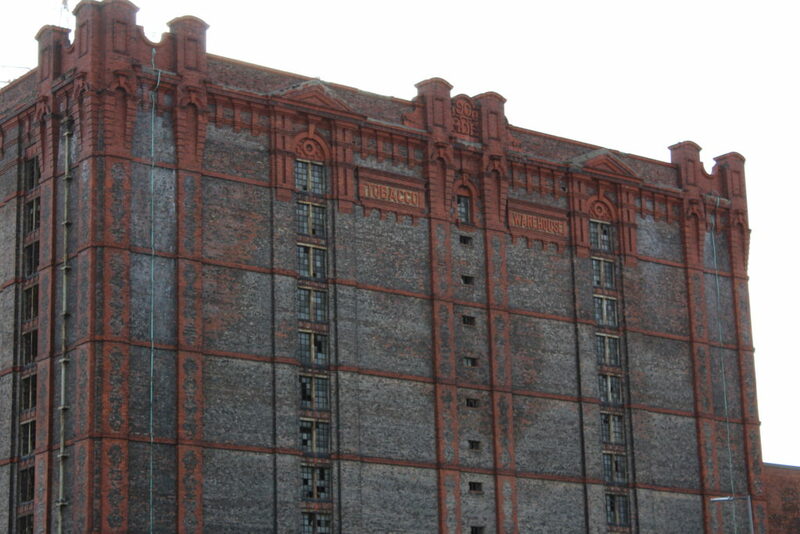 Stanley Dockis quite big – the Tobacco warehouse on one side of the dock was the largest free-standing brick building in the world when it was built (or so they told us when we were last here in 1986). 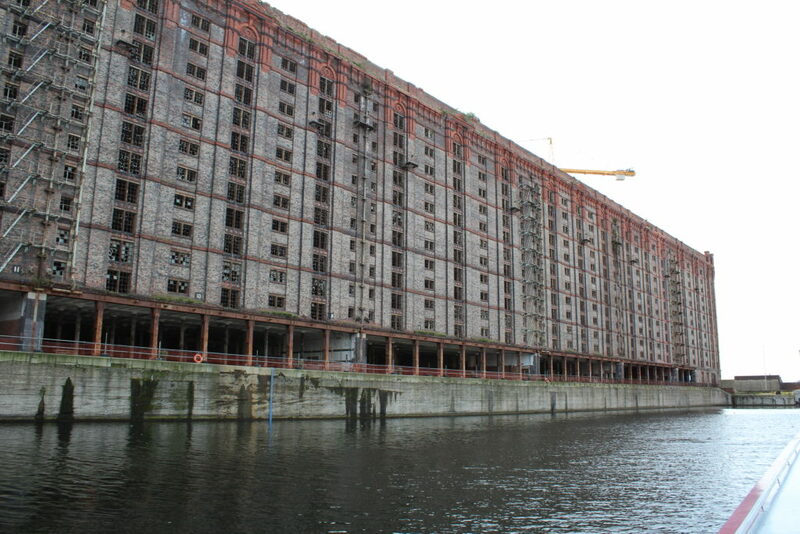 The warehouse on the other side which was also derelict back then has now been converted into The Titanic Hotel. 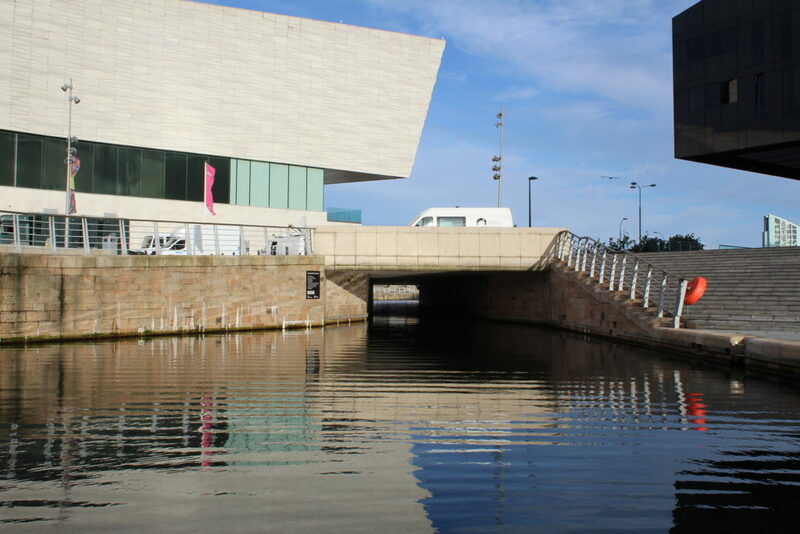 A sharp turn to the left brings you to Trafalgar Dock and “Sids Ditch” which is a channel cut through the dock which had been filled in with rubble. Exiting Sid’s ditch you keep the orange buoys to the right of you as you pass through Prince’s Half Tide Dock and under Prince’s Dock Causeway Bridge… then you have to keep the buoys to the left of you as you make your way through Prince’s Dock to Prince’s Dock Lock which is built into the end of the dock. 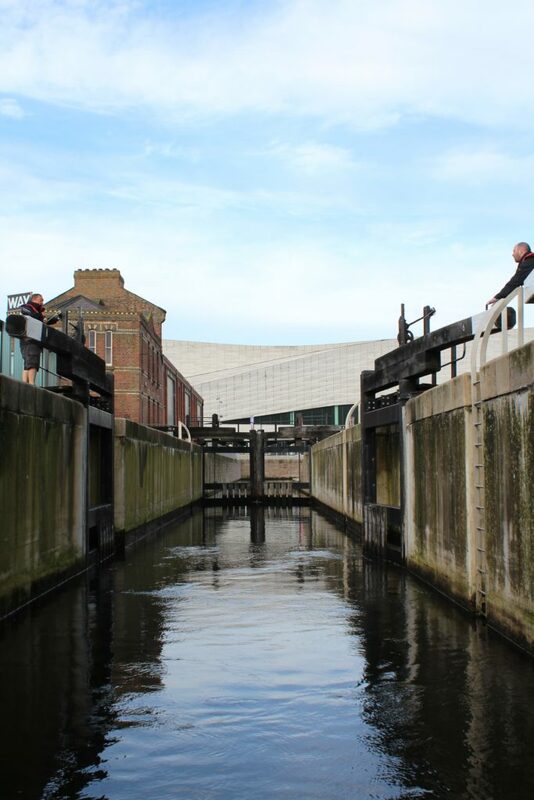 This is the end of the northern docks and the new lock takes you down into the new cut which was made from here down to the southern docks. 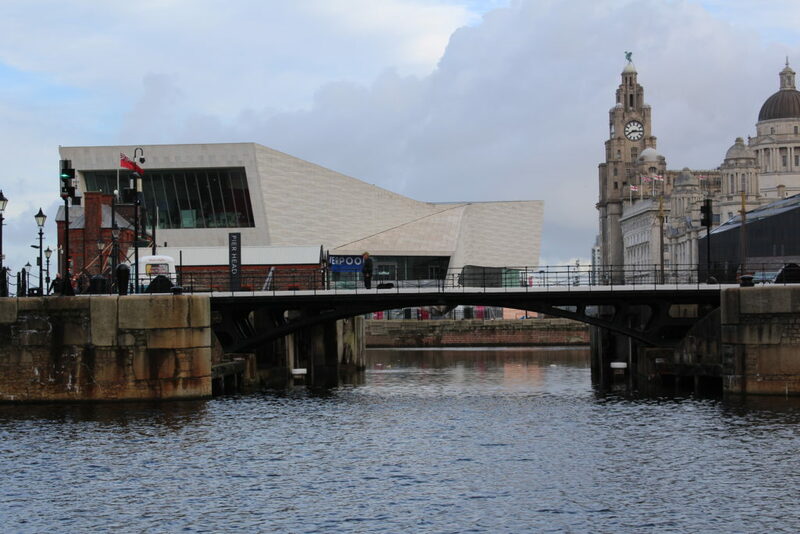 The new cut is primarily three “tunnels” with open spaces between them and it runs between the Pier Head and the water front buildings. 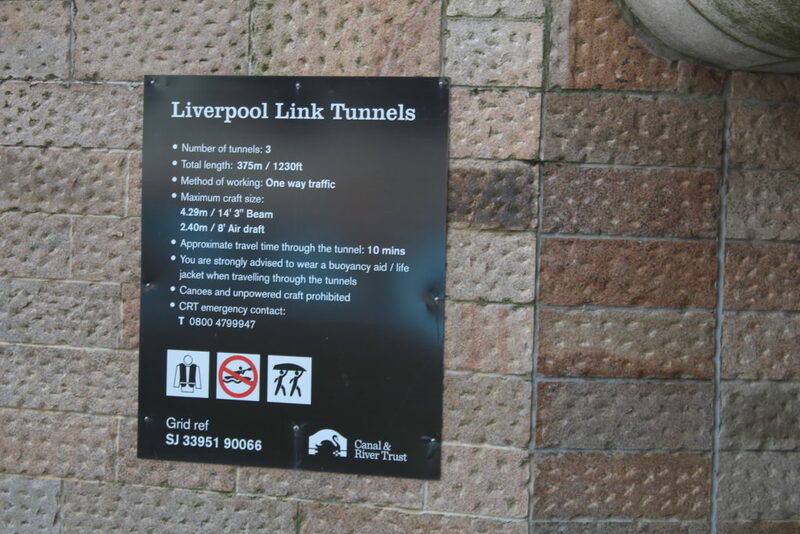 You exit the first tunnel into Liver Basin which is, as the name suggests, right in front of The Liver Building. 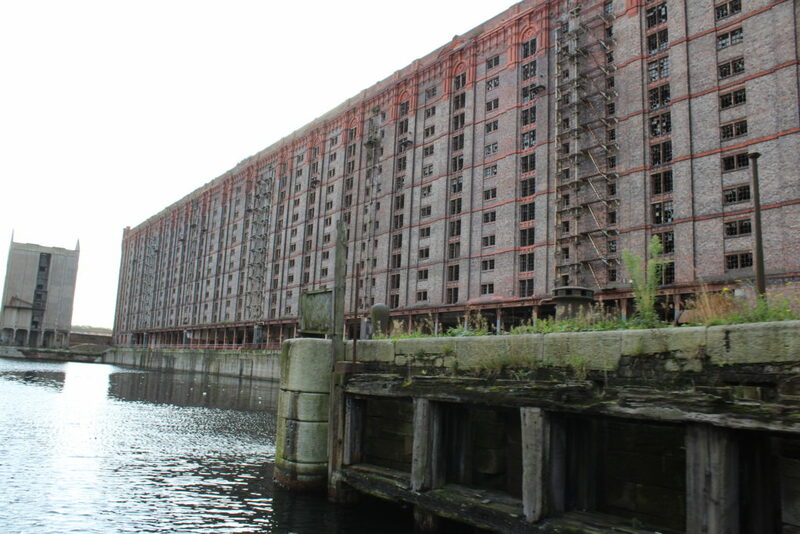 and into Canning Half Tide Dock . 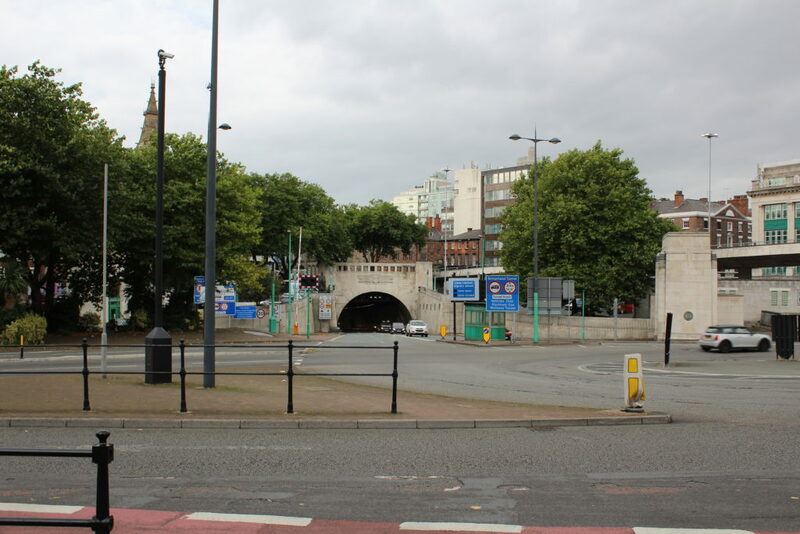 Then its another left turn under Hartley Bridge having made sure that the green light is on and the gate is down. 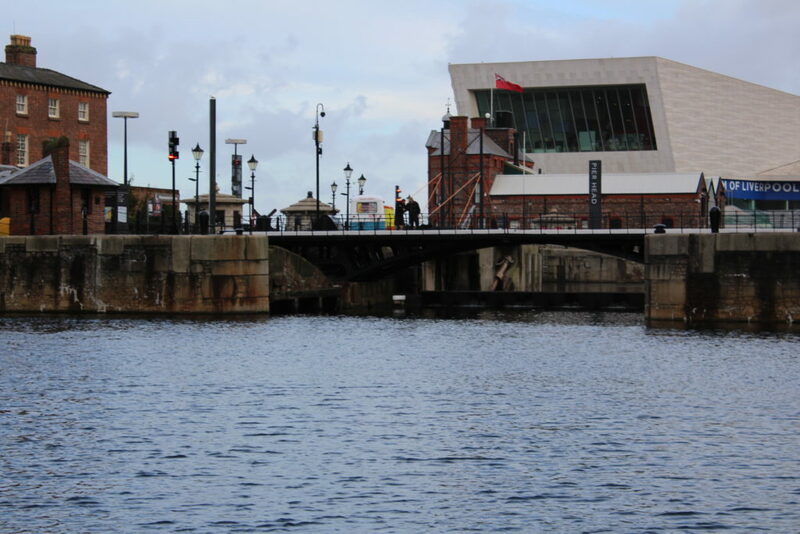 Another sharp left under Salthouse Quay Bridge takes you through into Salthouse Dock where you have to find your mooring. 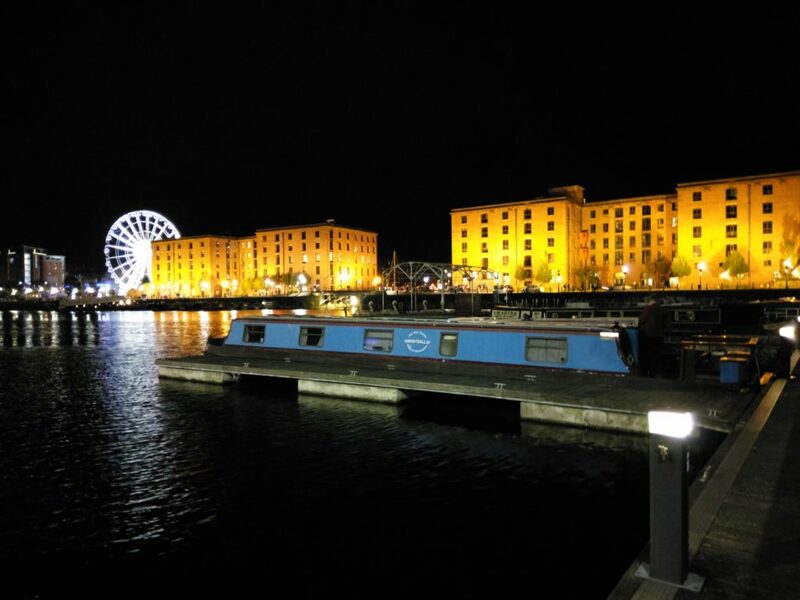 The moorings are all pontoons and have power points so you don’t need to worry about keeping your batteries topped up whilst you are there. We found ours and moored up for the day. 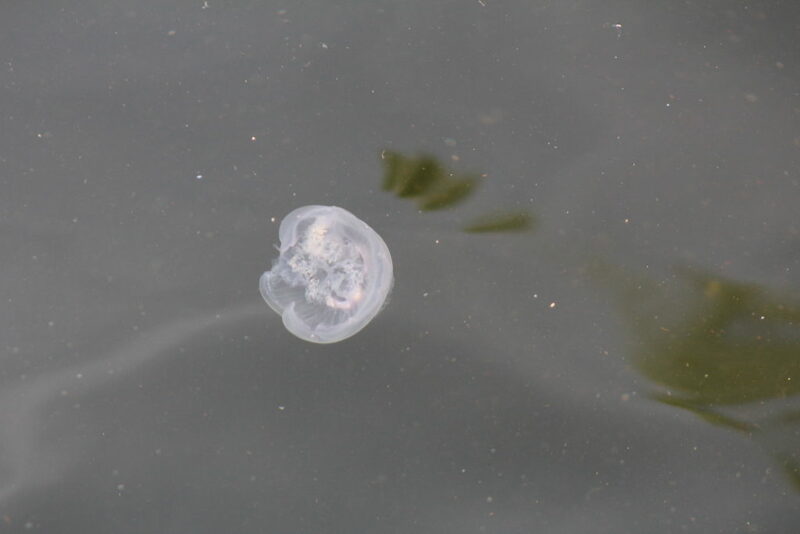 One thing we did notice – it’s salt water, or at least salty enough for jellyfish to thrive. 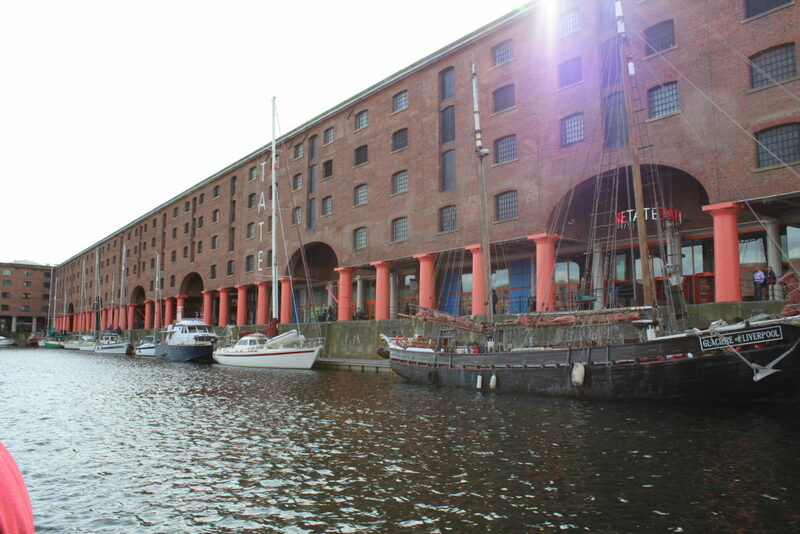 After mooring we wandered round the docks a bit – we went to the Maritime museum which is well worth a visit. 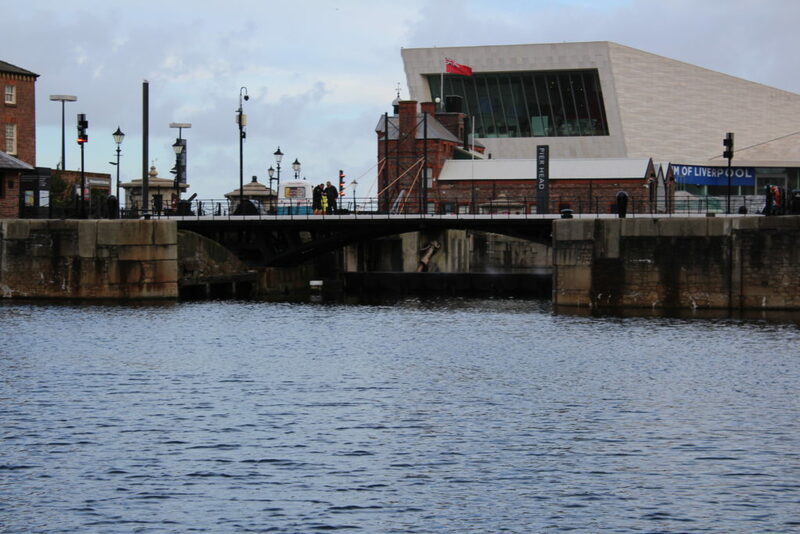 I’d been wondering what they meant about the gate at the entrance to the dock… well I found out just what they were talking about. 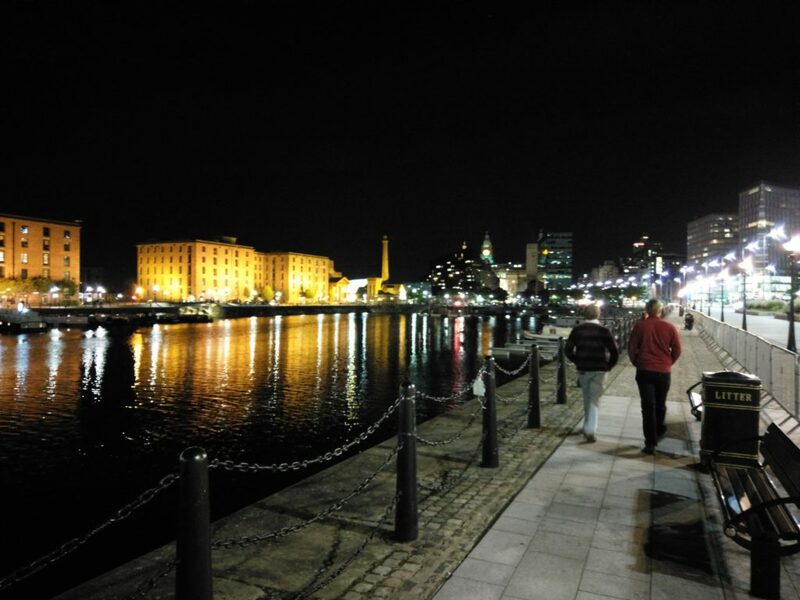 We headed off into the city for a few beers and a bite to eat before coming back down to the docks and visiting The Baltic Fleet for the last couple of pints of the evening. We then wandered back to the boat. 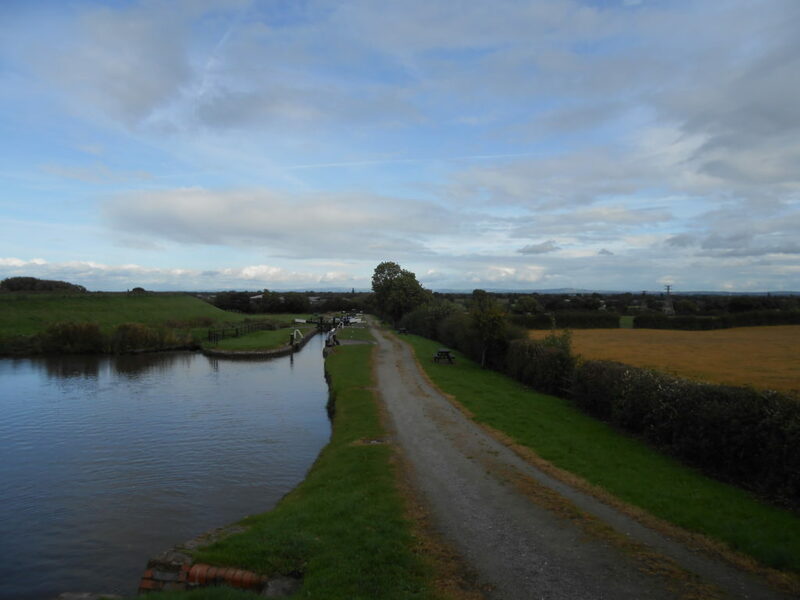 From Chapel Bridge No 7 to Lydiate Winding Hole, a distance of 14 miles, 1 flg and 7 locks. After very heavy rain over night we were surprised to wake to blue skies and sunshine, although it wasn’t too warm and when ever the sun went behind a cloud you definitely knew it was late September. 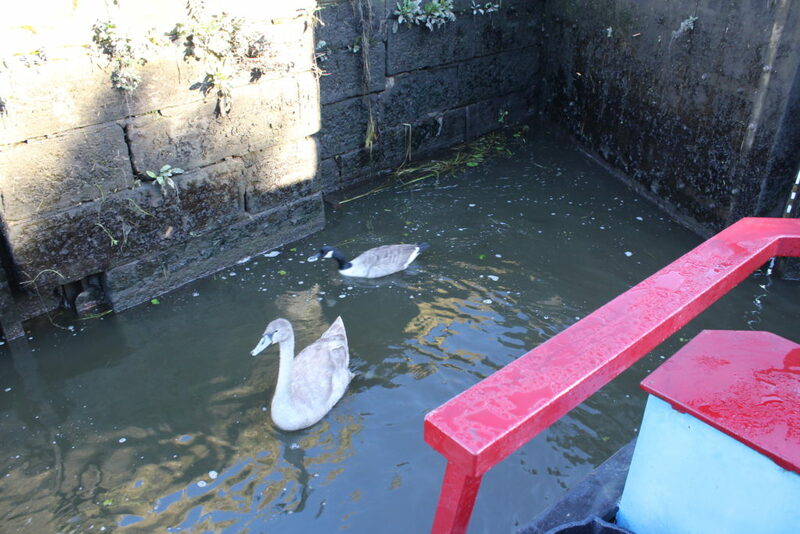 Progress back up the canal was a bit slower than coming down and at Chicken Lock No 6 we had two extra passengers in the lock in the form of a cygnet and a Canada Goose. 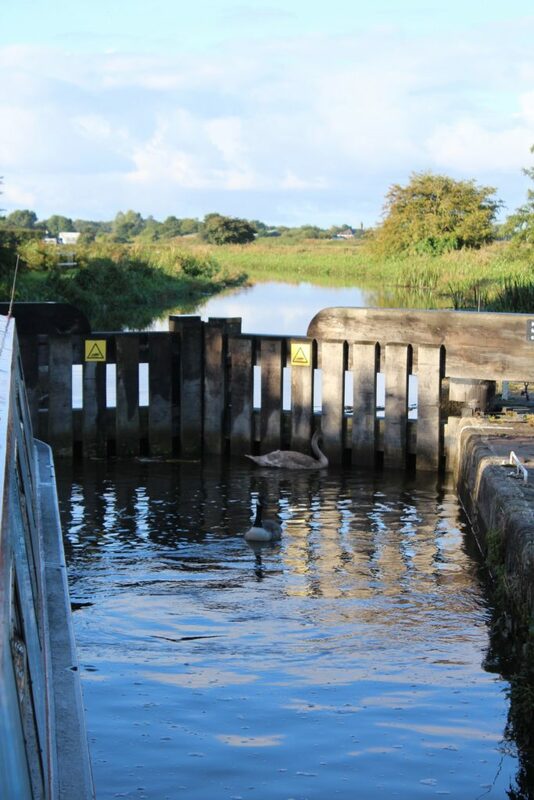 It became quite obvious very quickly that the swan knew just what it was doing as it dodged round the boat as we moved in the lock without getting agitated and as the lock got towards full it went up to the top gates and waited for us to open them before slipping out. Leaving without even saying Thank You! 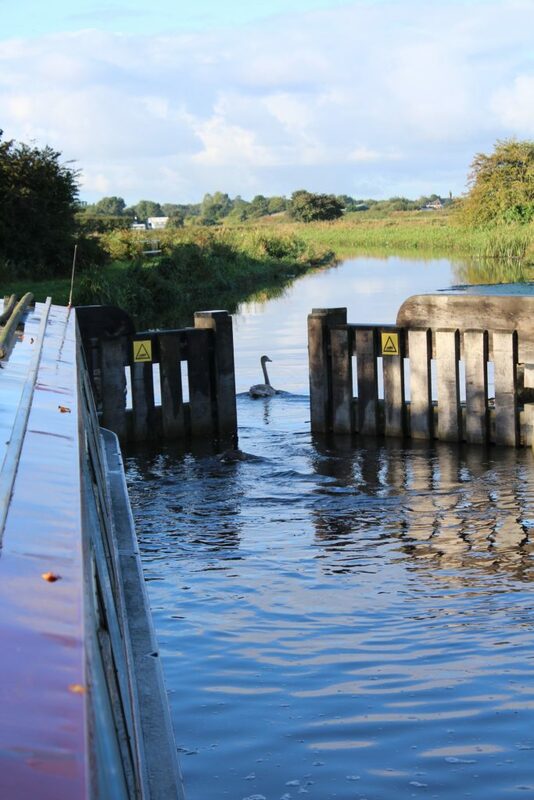 The swan did the same manoeuvre at German’s Lock No 5 so it’s obviously a regular practice. At Lathom Lock No 2 we met another couple of boats coming down with a couple of C&RT helpers – the woman on one of the boats seemed to be more focussed on telling us how to boat than actually doing any work…. The services block at Burscough Bridgehow has it’s services squeezed up at one and and the rest of the block is full of a cafe and a bar – but I’m not sure where you’re supposed to moor if you want to visit either of them, or go and pick up some supplies at the Spar store just over the bridge. 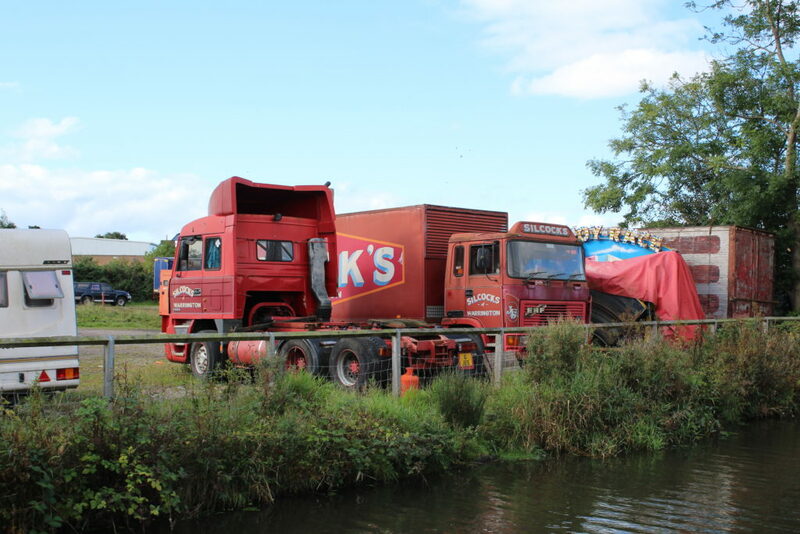 Silcock’s have always had a depot at Burscough but it seems to be turning more into a junk jard now…. although I suspect that middle truck is probably worth something to a collector. 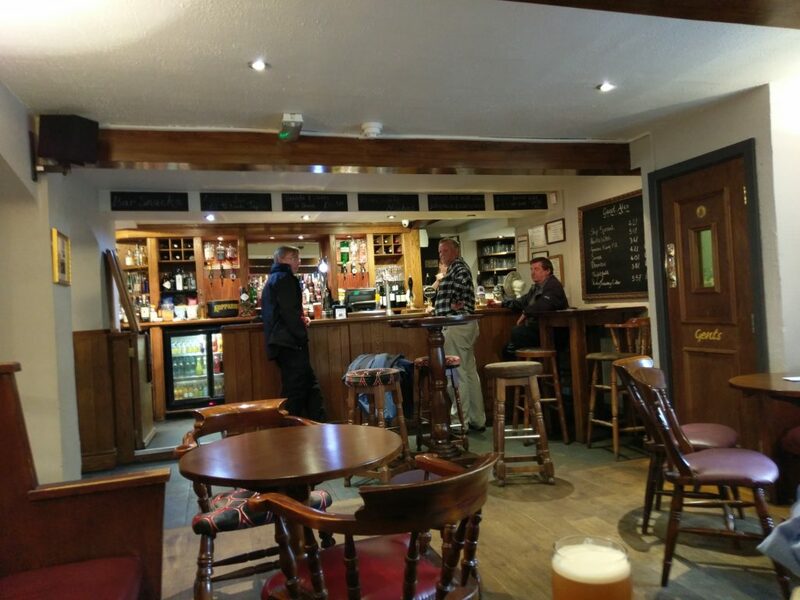 It was good to see that both the pubs atCrabtree Swing Bridge No 32 and New Lane Swing Bridge No 31 are still open and seemed to be doing quite good business. It used to be that as you approached Martin Lane Bridge No 29 and if the weather was clear then you could see Blackpool Tower standing right out on the horizon, but you can’t see it any more due to the fact that someone has let some trees grow which is a pity. 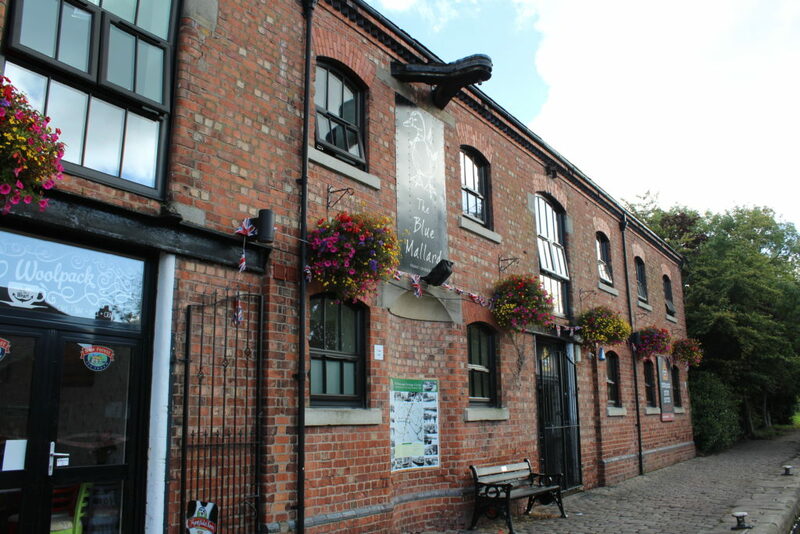 The Ship Inn at Ship Bridge No 22 has limited moorings but is open all day and serves food all day. 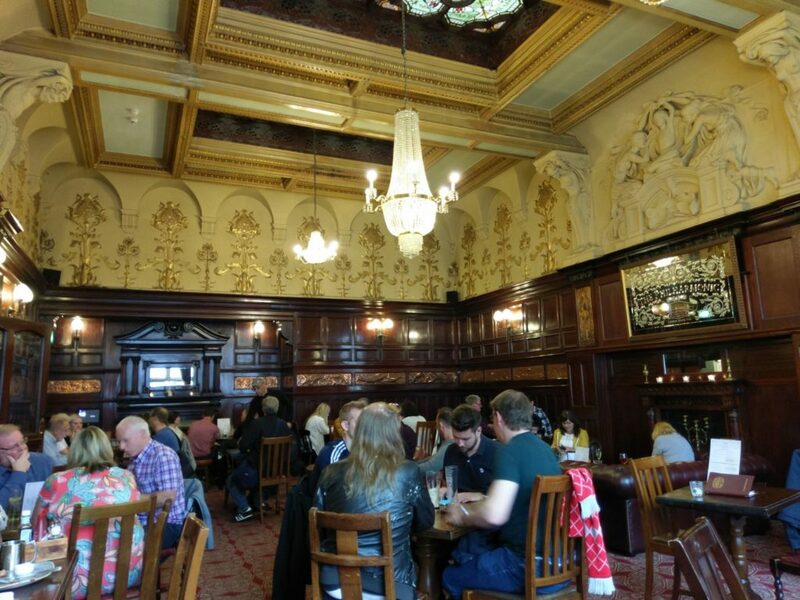 So as we were well ahead of schedule we stopped for a pint, and then walked to investigate the other pub, but it had closed for the afternoon so we looped back to the Ship for a second pint. We arrived at Lydiate mid afternoon and so we did some painting and general tidying up of the boat. It’s nice to see that MMBC, who used to have some grumpy members, still maintain that tradition. We walked up to the Scotch Piper where we met Paul, and after a supper on the boat we returned to the Scotch Piper for a few more beers.